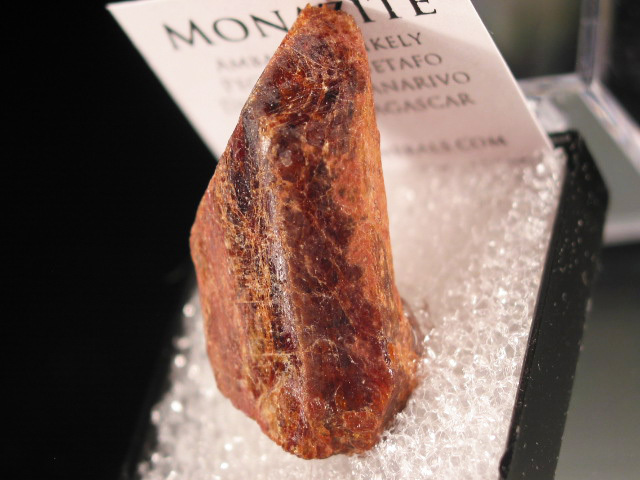 A selection of 48 thumbnail specimens from around the world, from common species to rare ones, in all price ranges. 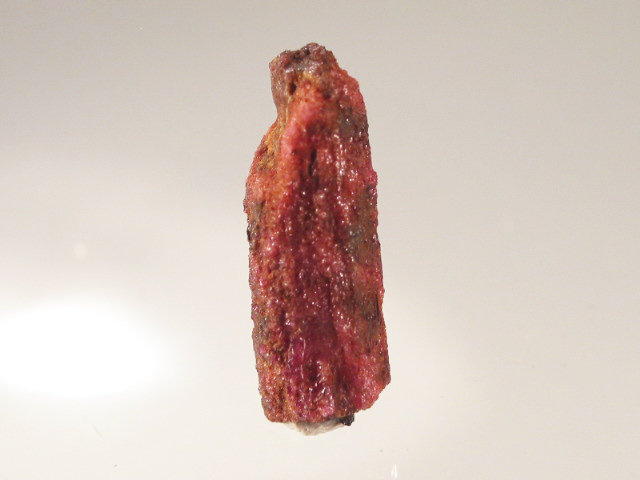 A very nice thumbnail specimen consisting of a parallel growth of purplish red liddicoatite crystals. 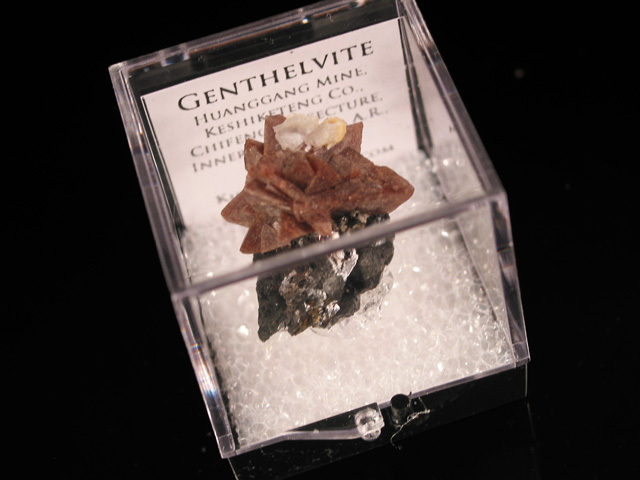 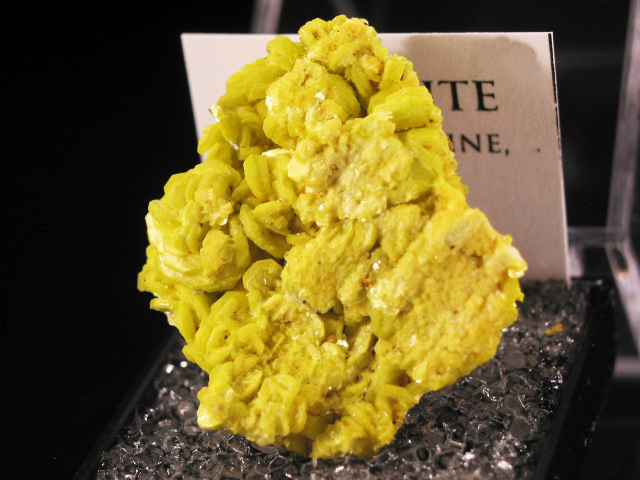 A beauiful thumbnail of genthelvite, with a starburst cluster on a bit of matrix. 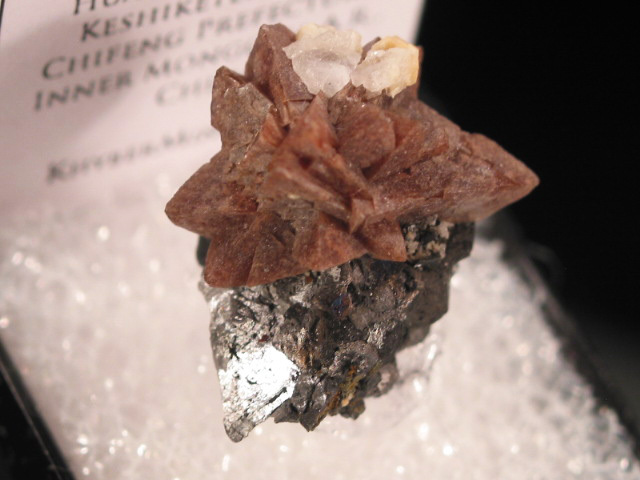 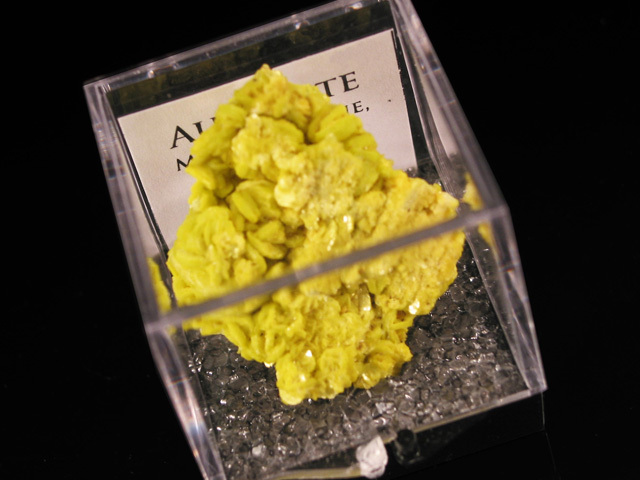 Neither "starburst" clusters or matrix specimens are rare, but funding a thumbnail that has both is-- usually the clusters are off matrix or on absurdly large ones. 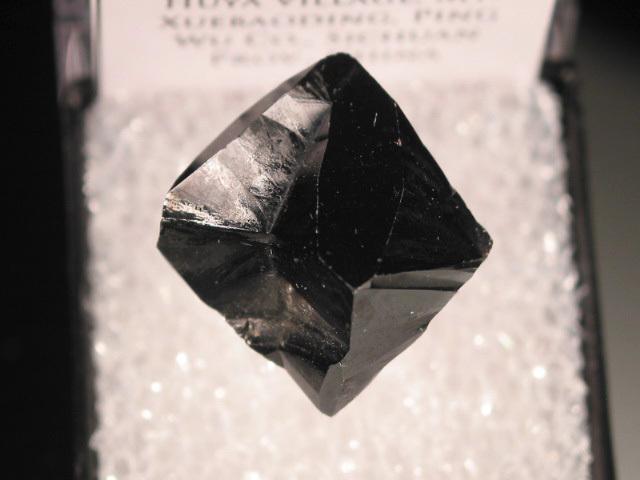 This piece has just the right proportions for a perfect thunbnail. 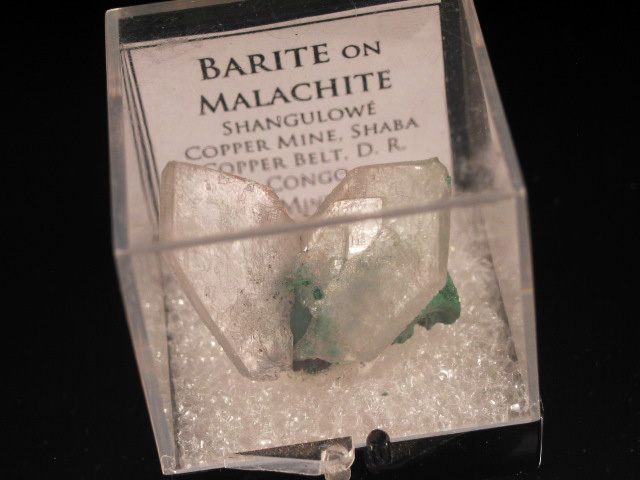 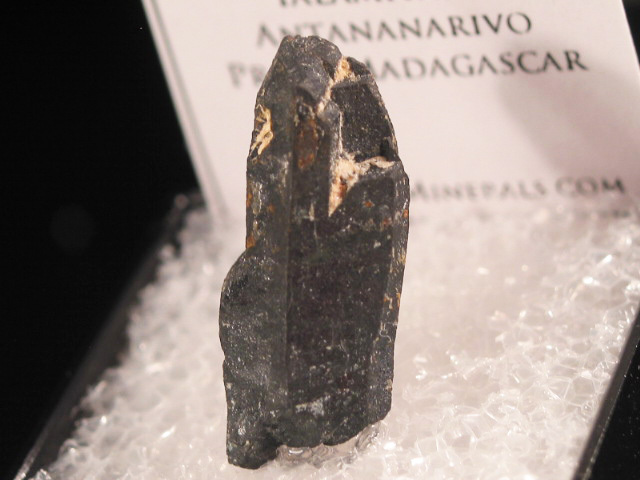 An old thumbnail of barite on malachite from Shinkolobwe, located in southern D.R. 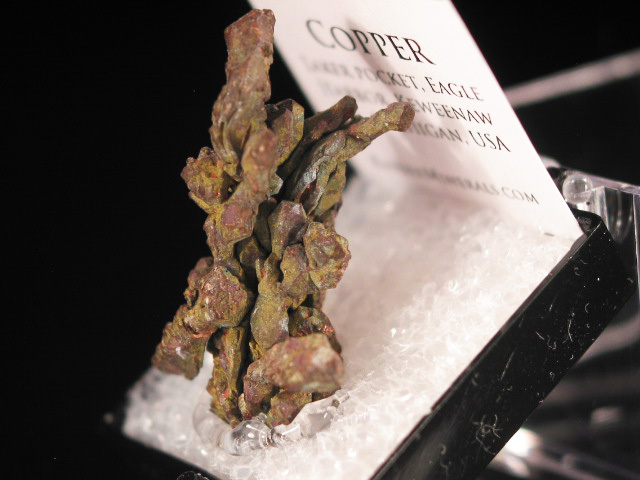 Congo's copper belt. 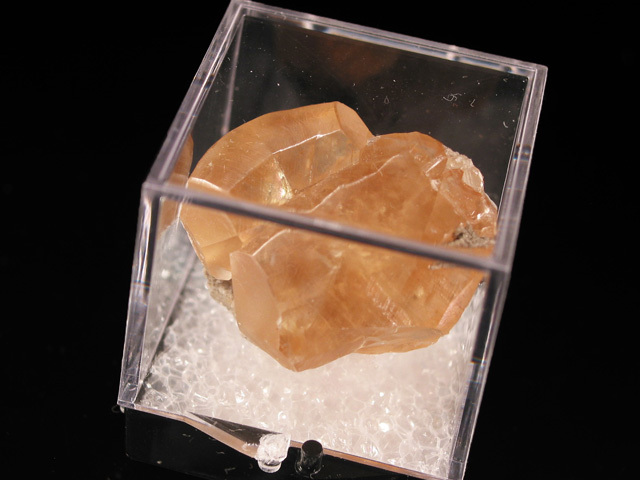 The arrangement of this piece is particularly aesthetic. 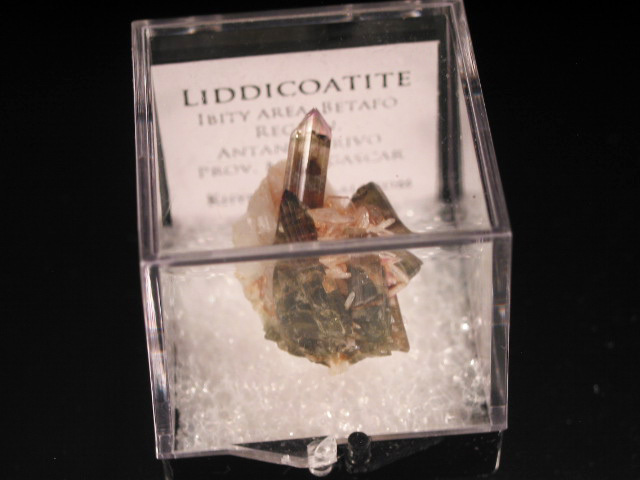 Almost nothing comes out these days, except for the odd bit of cuprosklodowskite or other uranium secondaries from the mine dumps, though with Chinese firms moving into the area, there is hope that some some point in the next several years, more specimens will be found..
A beautiful little thumbnail of liddicoatite tourmaline, consisting of a few small, multicolored crystals on a bit of matrix. 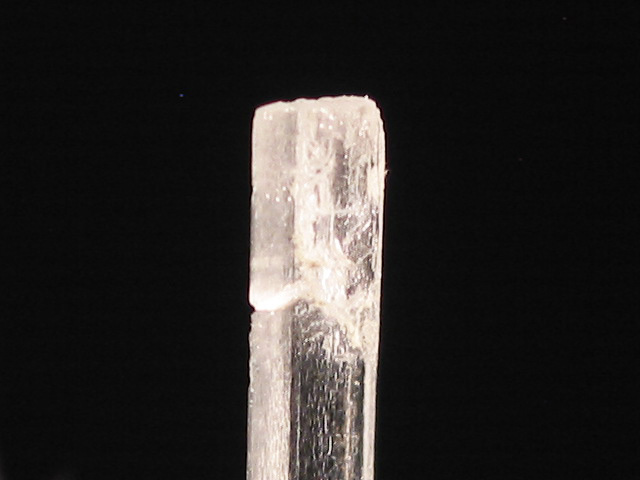 The upper right hand crystal is not terminated, but it doesn't detract from the piece. 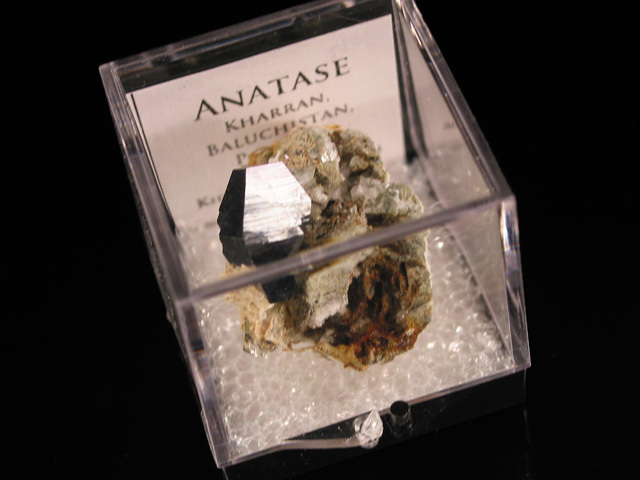 A nice thumbnail of anatase on matrix, with a lustrous, 1.2 cm doubly terminated crystal nicely positioned on its matrix. 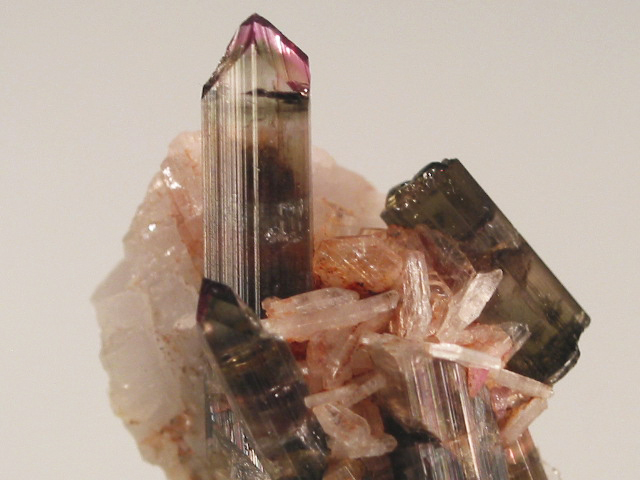 I thought this was a a particularly nice thumbnail from the locality. 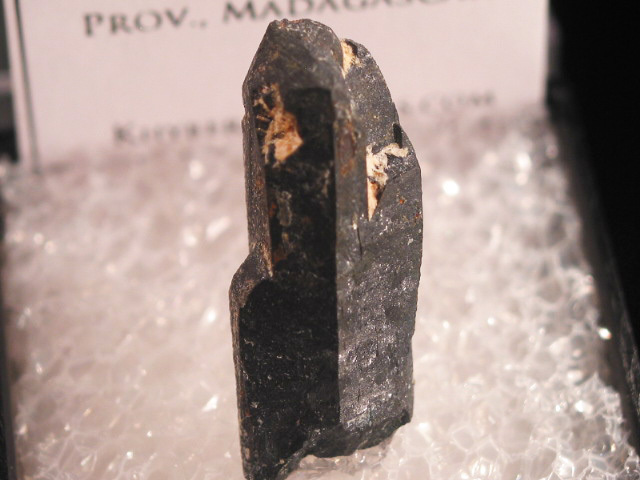 I think it's actually a little nice in person-- the pictures make it look a bit flatter. 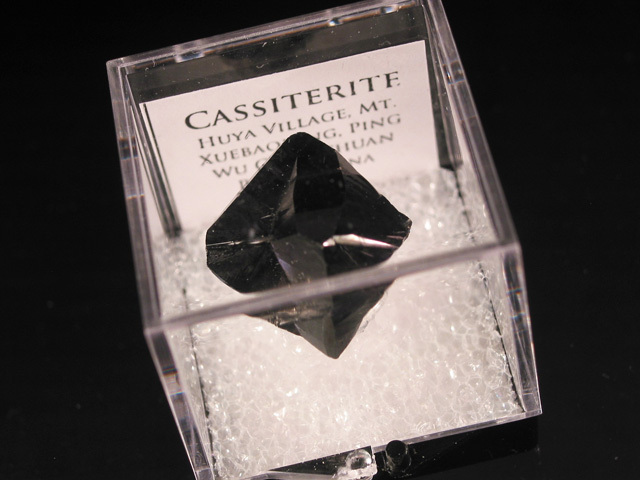 A very sharp single crystal of cassiterite, from older finds at mt Xuebaoding. 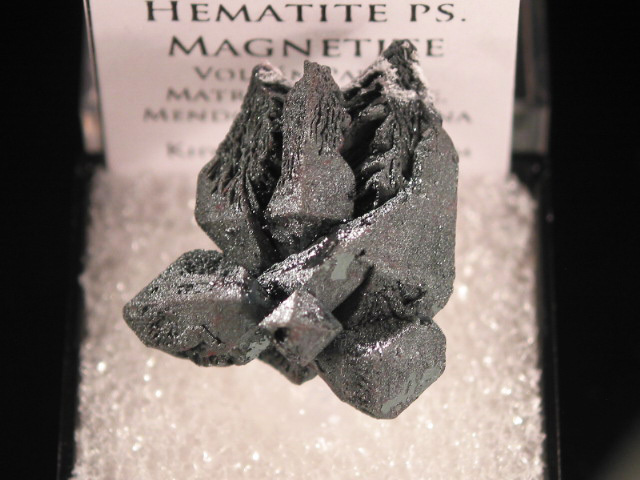 An excellent lustrous and damage free example. 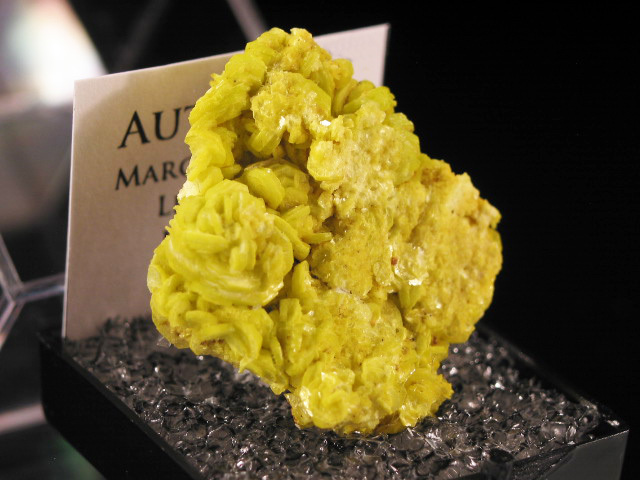 A nice large thumbnail of French autunite, from finds made pre-1960. 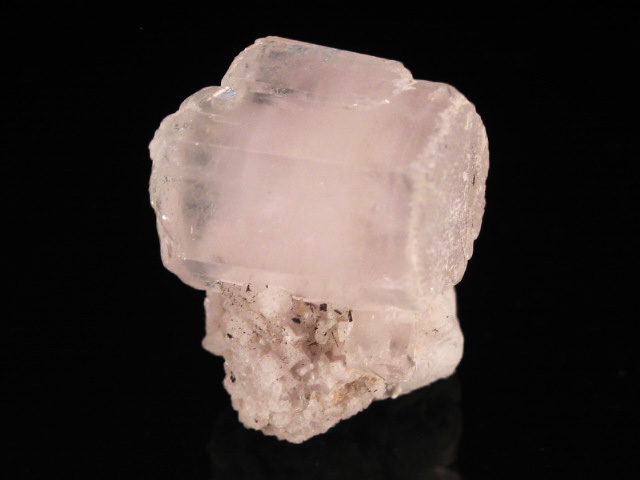 A beautiful thumbnail calcite from the Linwood Mine, in Iowa. 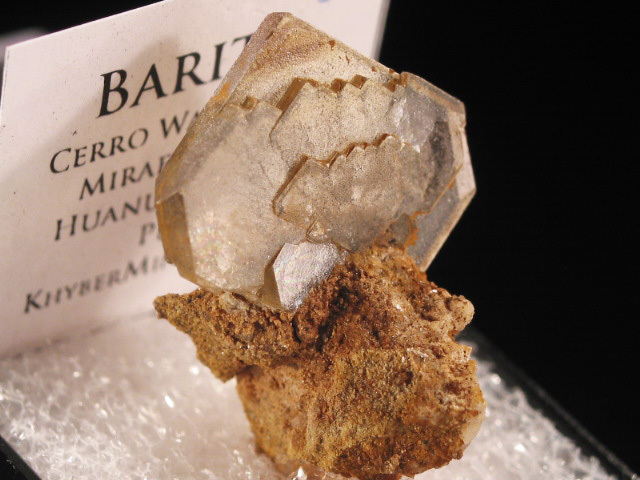 This is the same location that produced the major find of large barite crystals a couple years ago. 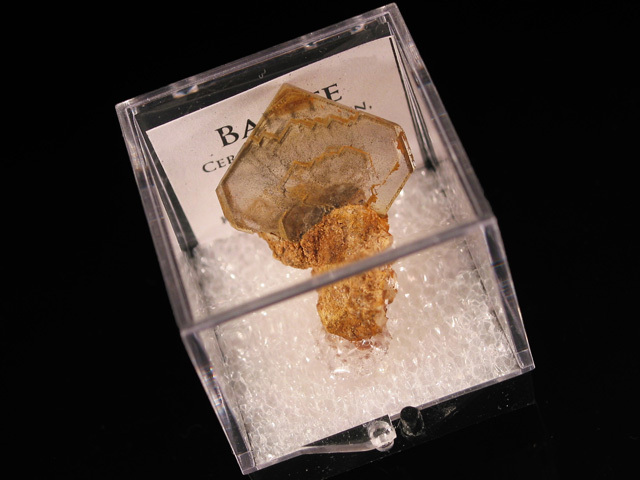 Although the barites have been marketed most heavily to collectors, the real treasures from the locality are the calcites. 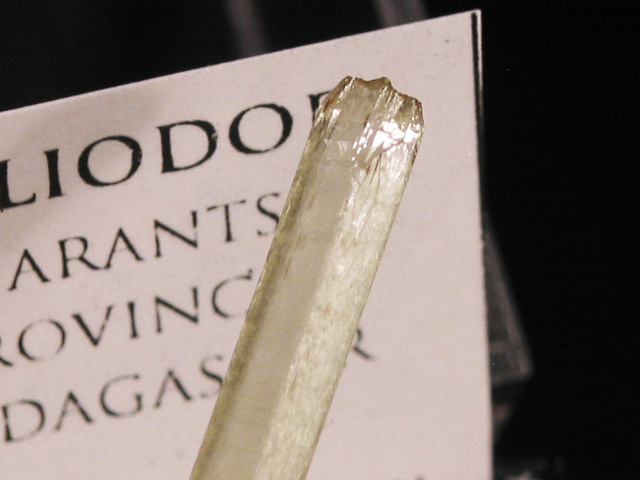 They tend to be somewhat large, though this is a very nice thumbnail example. 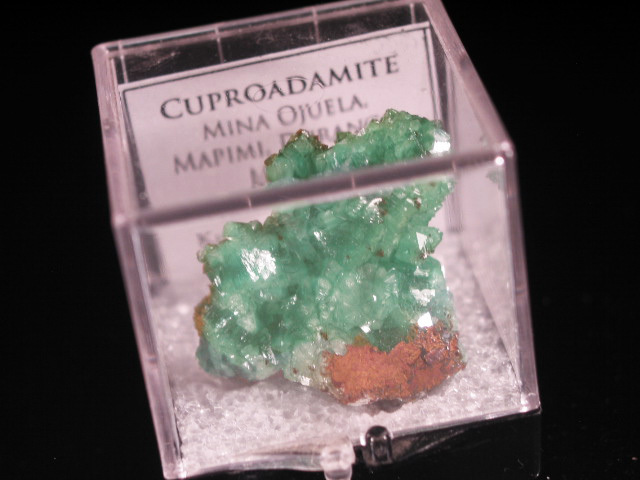 A very bright green thumbnail of cuproadamite from Mina Ojuela. 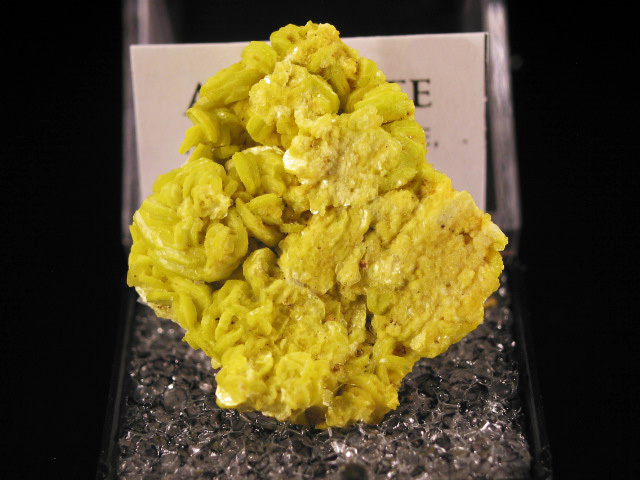 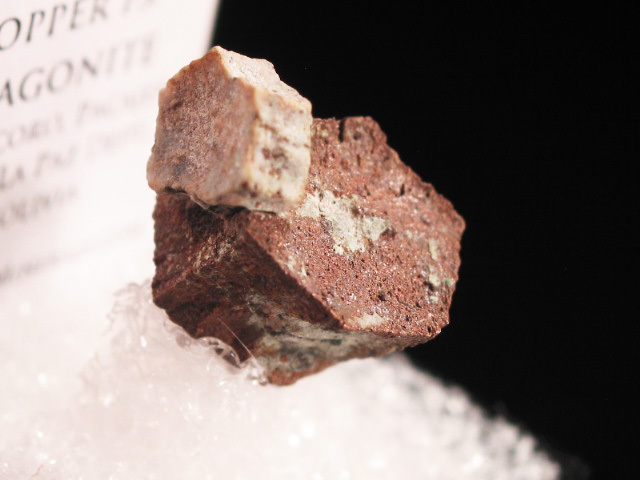 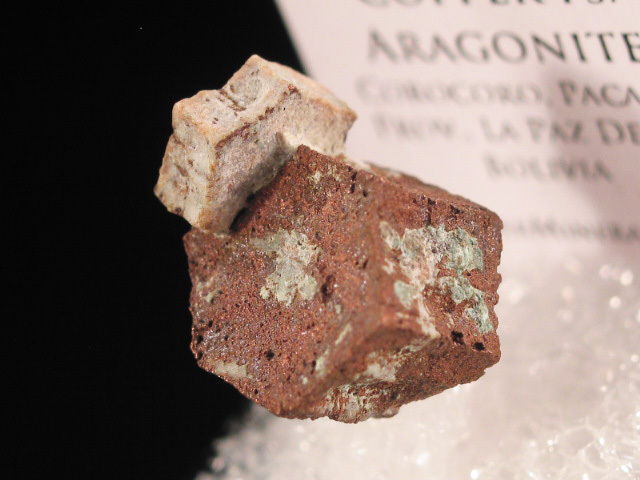 Although there have recently been small finds of cuproadamite at this locality, the color of the newer specimens has not been nearly as bright or saturated as that of older specimens such as this one. 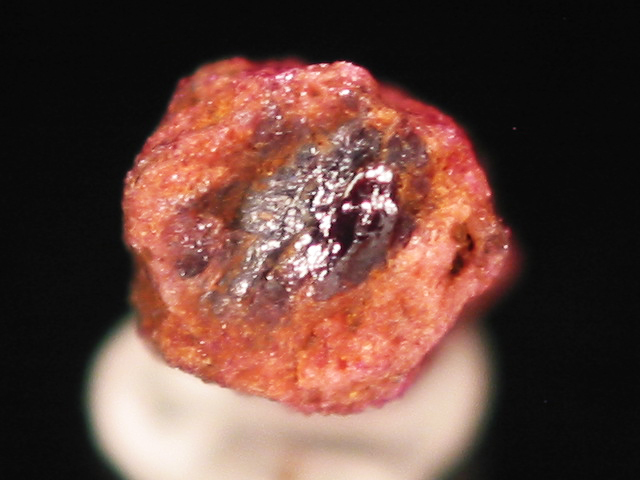 The vast majority of adamites from this location are the yellow variety, cuproadamites are considerably rarer, and manganadamites (purple) are the rarest of all. 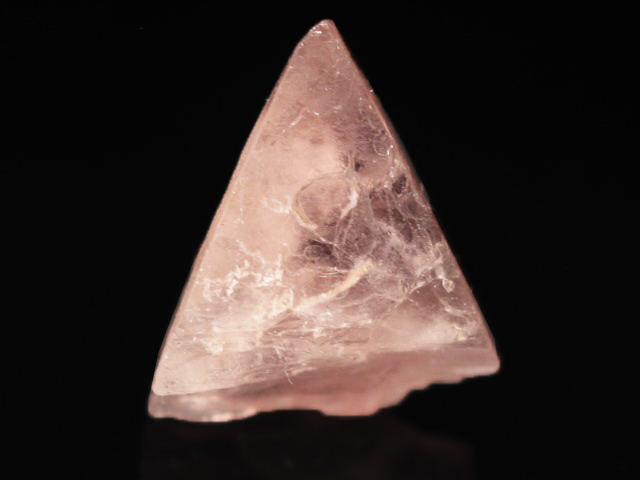 A nice mostly complete octahedron of pink fluorite from Inner Mongolia. 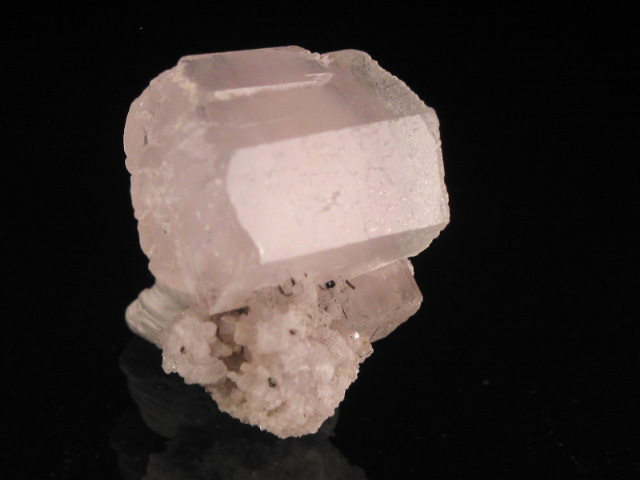 A really nice thumbnail of this material, with several light purple, hexagonal fluorapatite crystals perched on a quartz crystal. 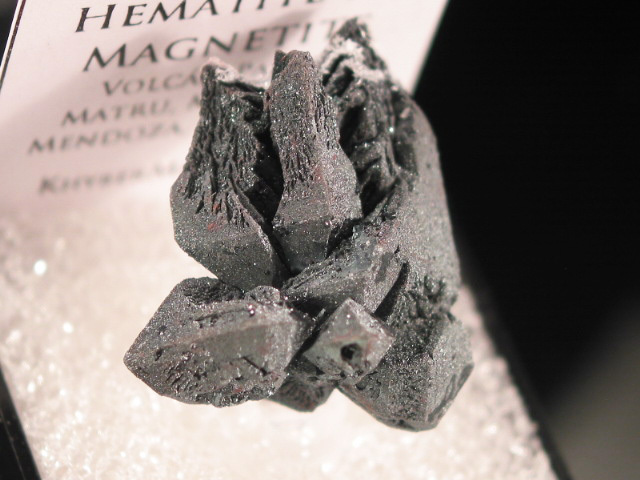 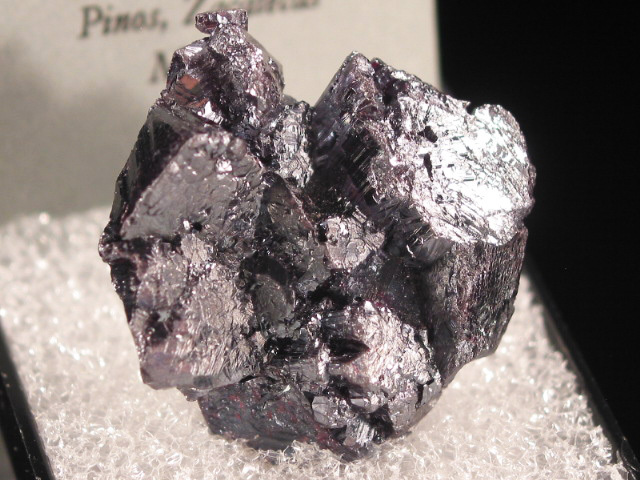 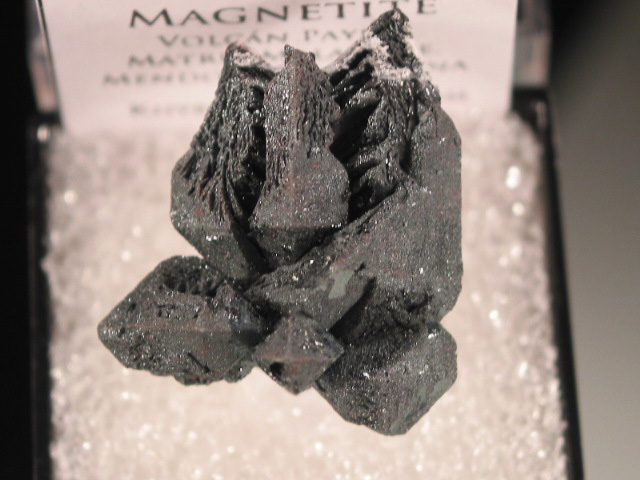 A nice sharp and lustrous thumbnail of hematite after magnetite, from Argentina. 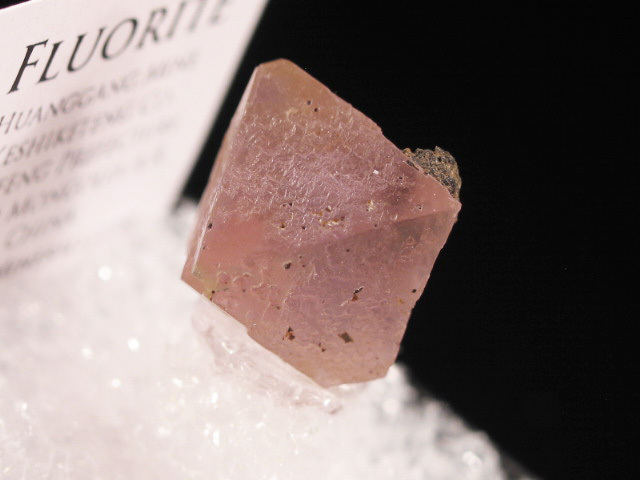 A nice thumbnail sized example of fluorite on a bit of lollingite from Inner Mongolia. 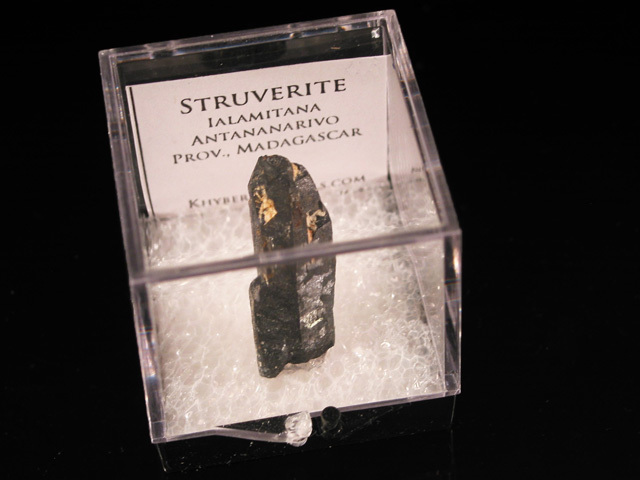 This is another example of something that is usually only seen as miniature and larger sized examples-- the small bits always seem to be shards, but this one is complete all around and even has a nice bit of matrix. 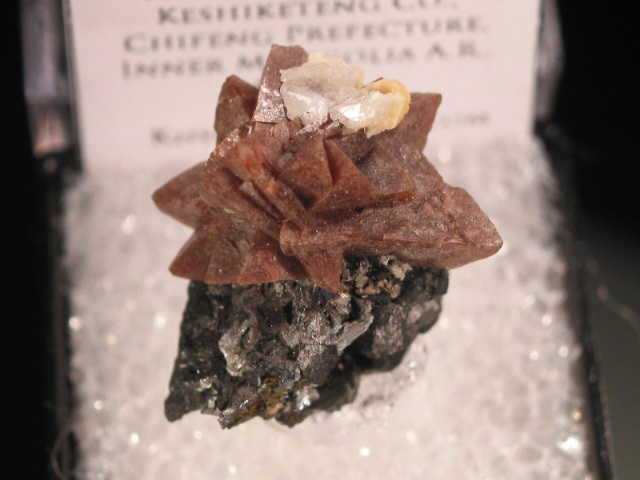 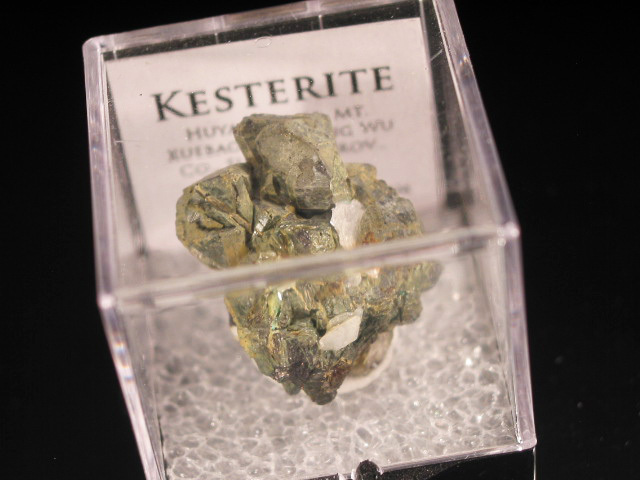 A heafty thumbnail cluster of the rare mineral kesterite. 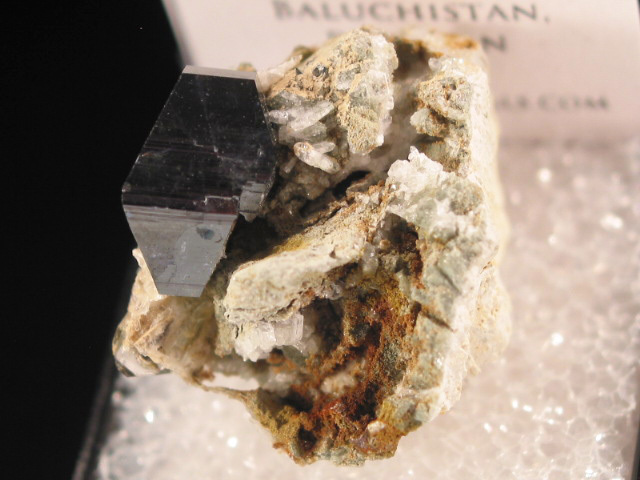 The kesterite at this locality is actually dark and metallic, but a thin mushistonite coating makes them all look green. 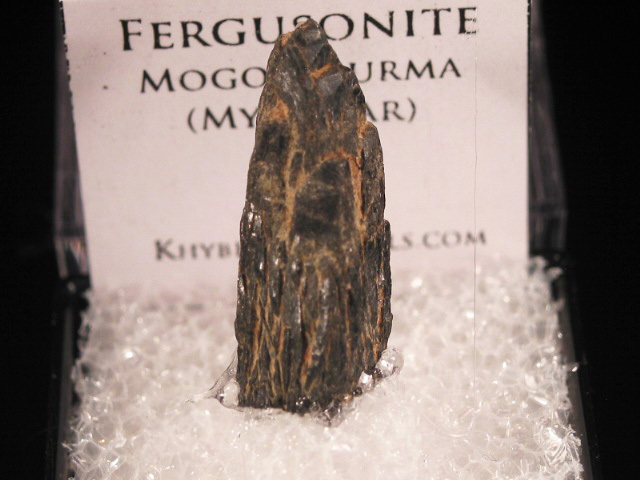 This is a very good thumbnail example of the species, certainly larger than the average specimen. 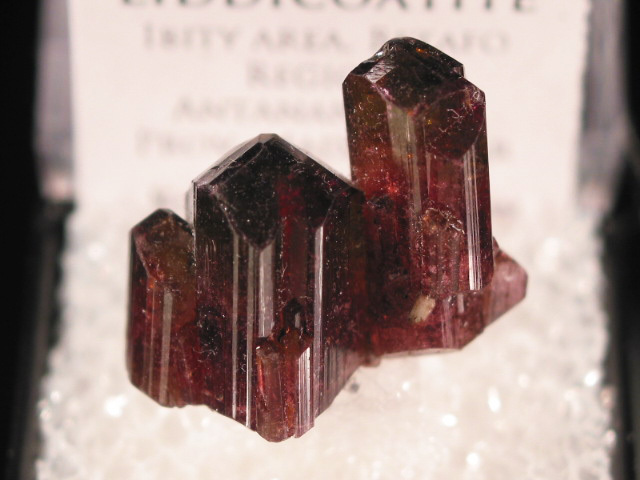 For a while in the 90"s these were called "pandaite" and were thought to be a new species, but were subsequently discovered to be a combination of two already known species. 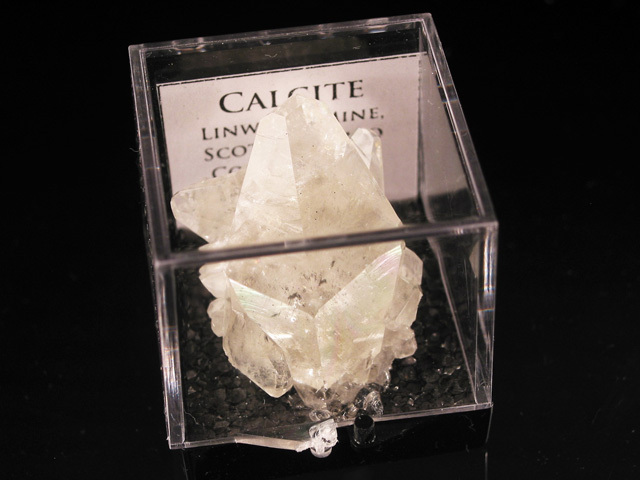 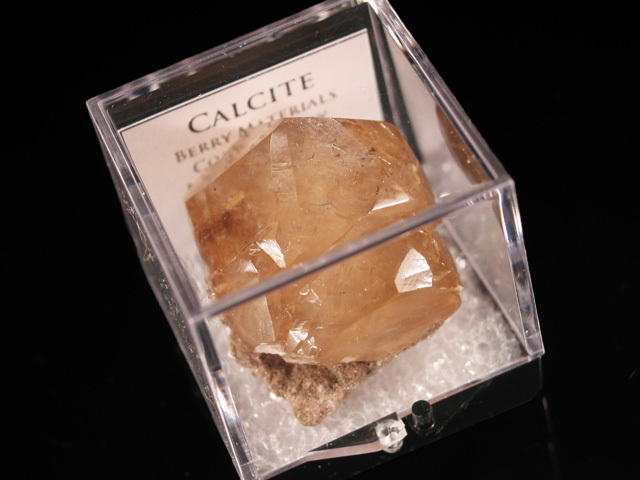 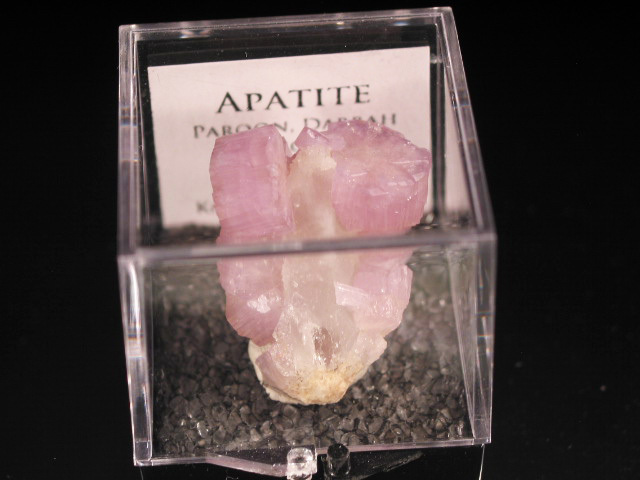 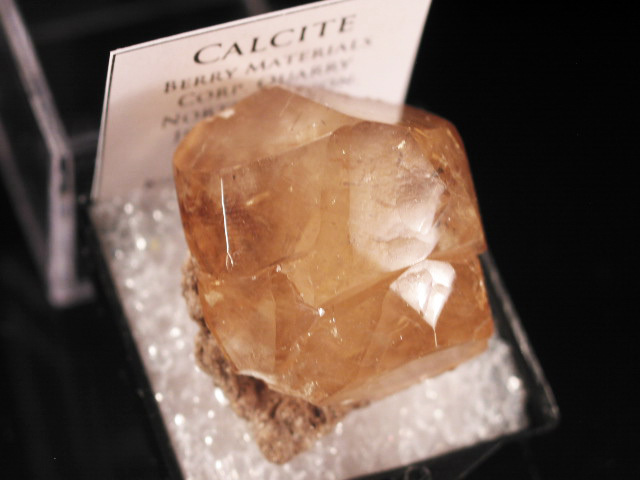 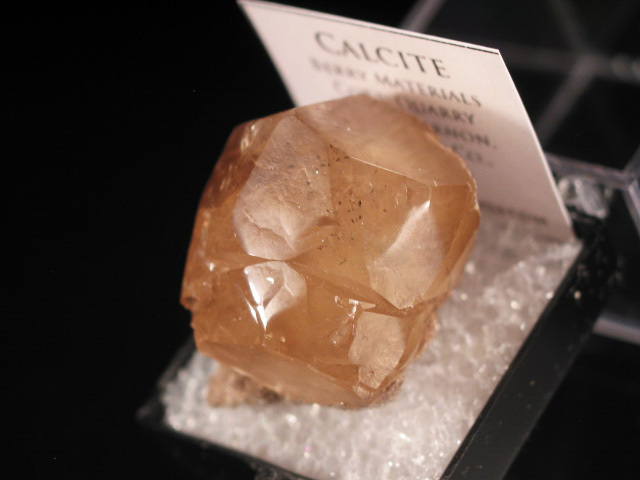 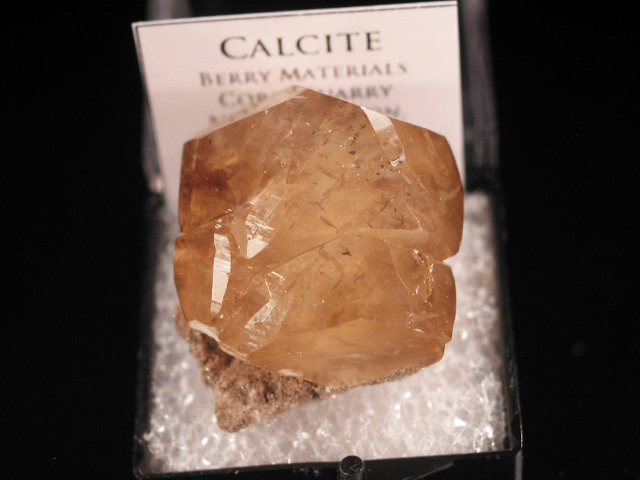 A nice sample of calcite from the Berry Materials Quarry, located in the Midwestern American state of Indiana. 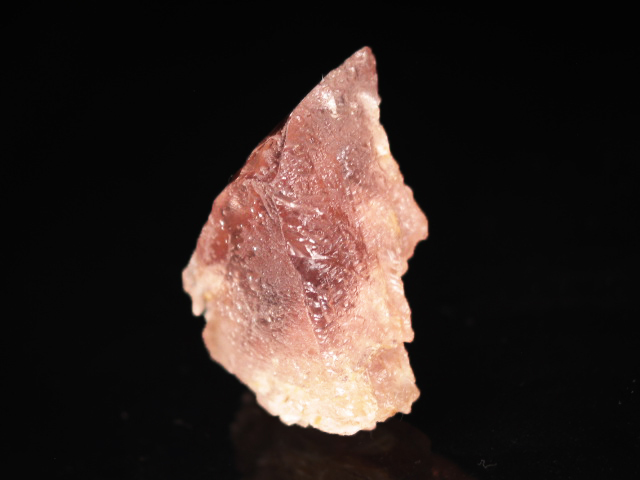 This piece has a nice honey colored crystal on a sliver of matrix, and displays the rounded form typical of specimens from the locality. 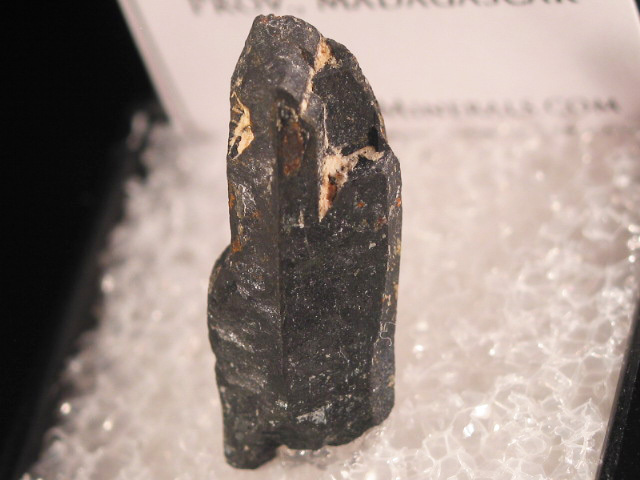 A nice thumbnail consisting of a relatively sharp and well termianted crystal of monazite from Madagascar. 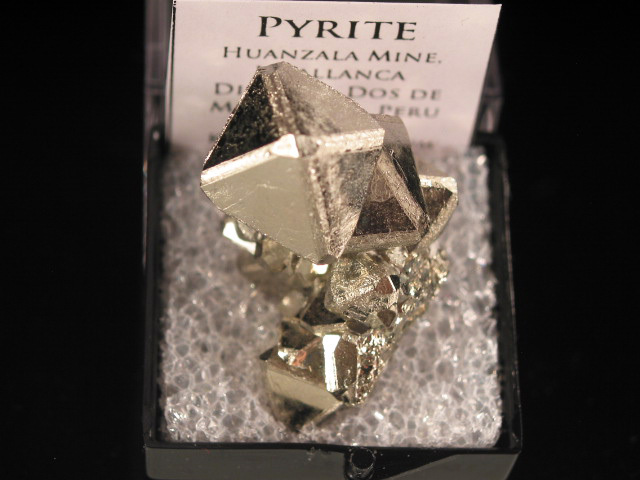 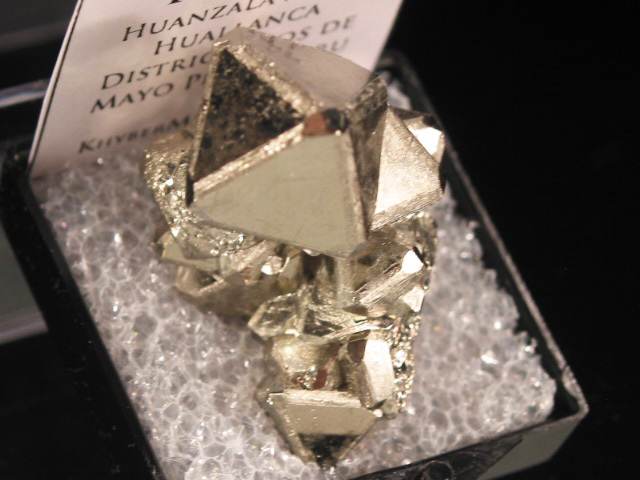 A small but very well arranged example of cubo-octahedral pyrite from Huanzala. 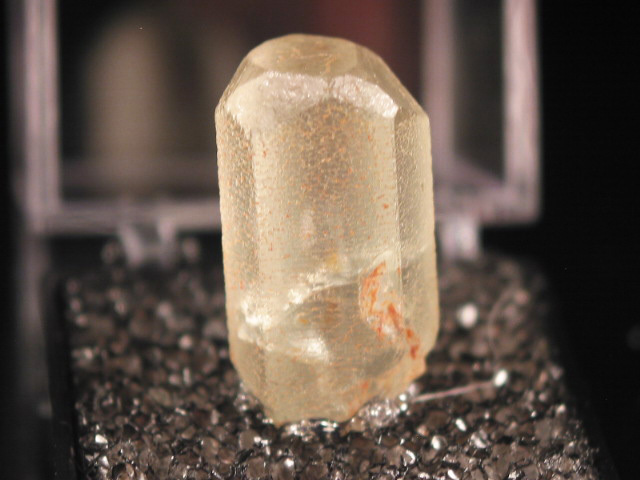 This is a large thumbnail that would not seem at all out of place surrounded by pieces worth much more. 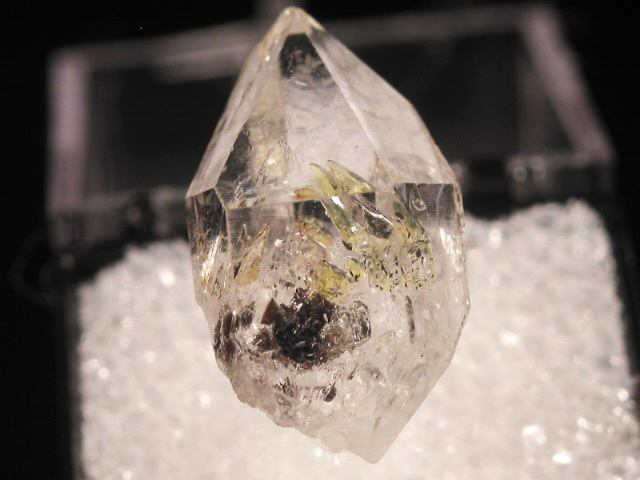 Although the crystals are small, the piece has a mirror luster-- I can actually see my eye's reflection (the image is just bit fuzzy) on the crystal's surface. 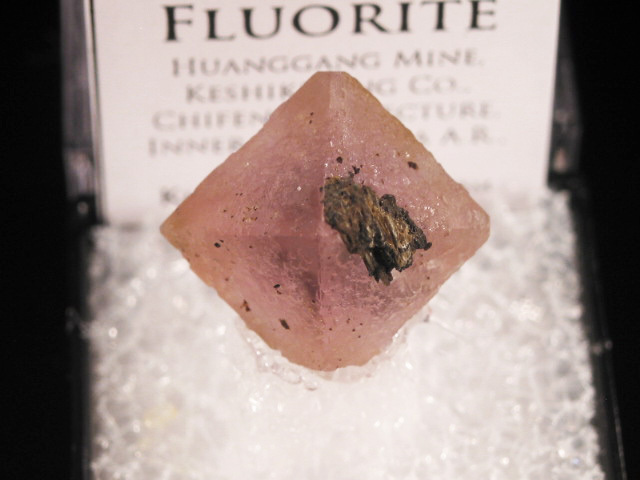 After decades of prolific specimen production, the mine is now owned by a Japanese company. 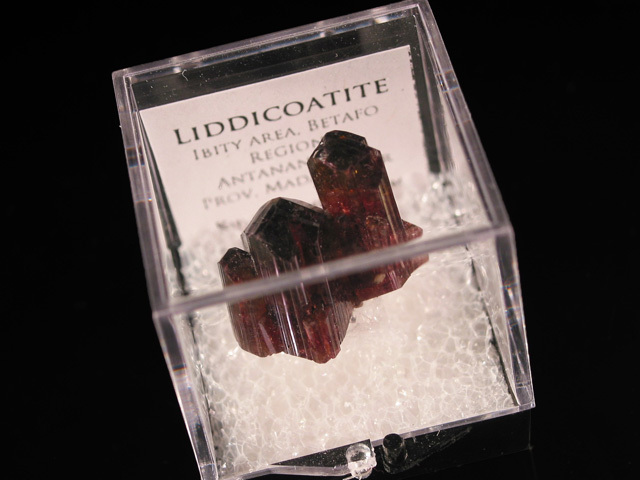 For safety reasons, they have cracked down on specimen collecting, so little if anything makes it out anymore. 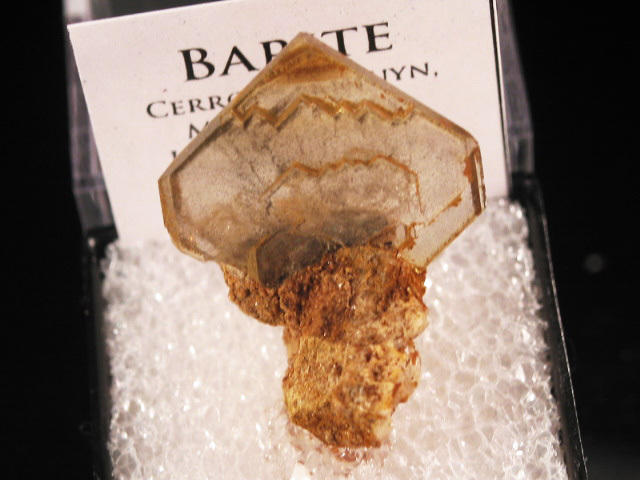 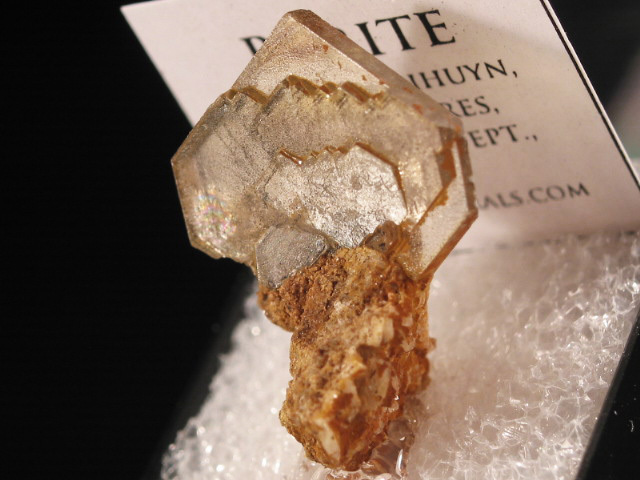 A nice thumbnail sized barite crystal, aesthetically perched on a bit of matrix, from Peru. 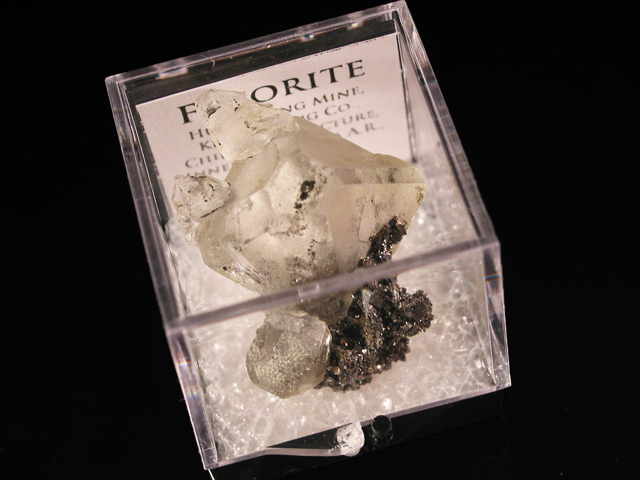 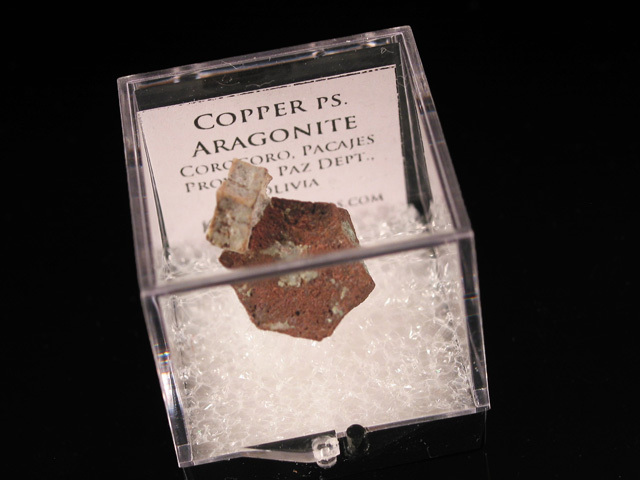 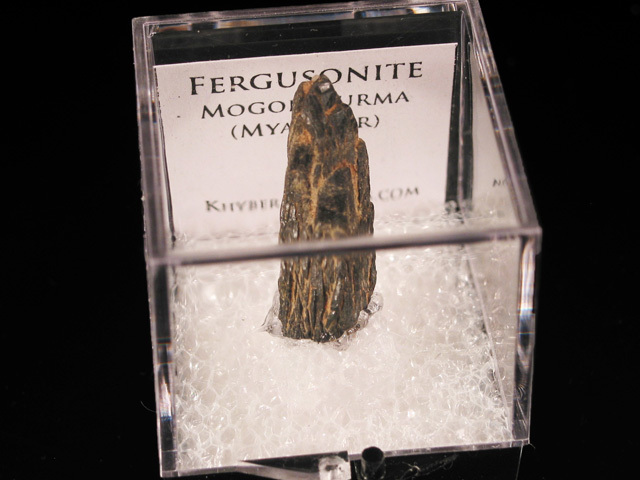 A great example of sigloite and paravauxite from the 2006 find. 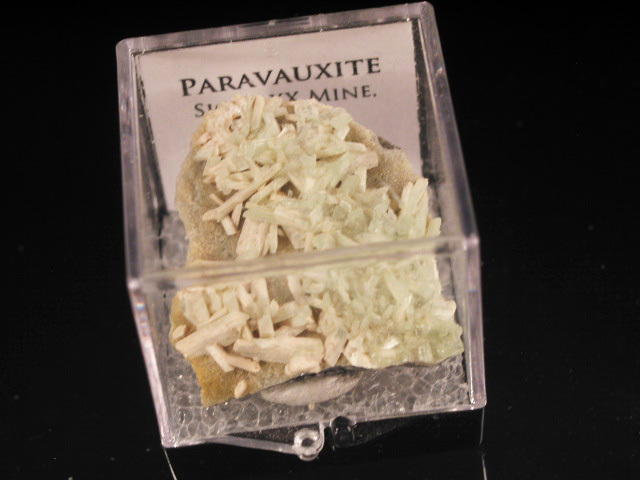 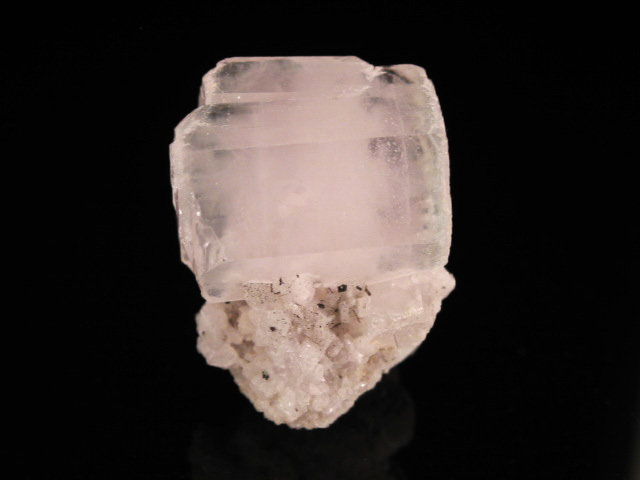 It combines numerous complete, double terminated sigloite crystals with light green paravauxites, and accentuates the contrast between the two. 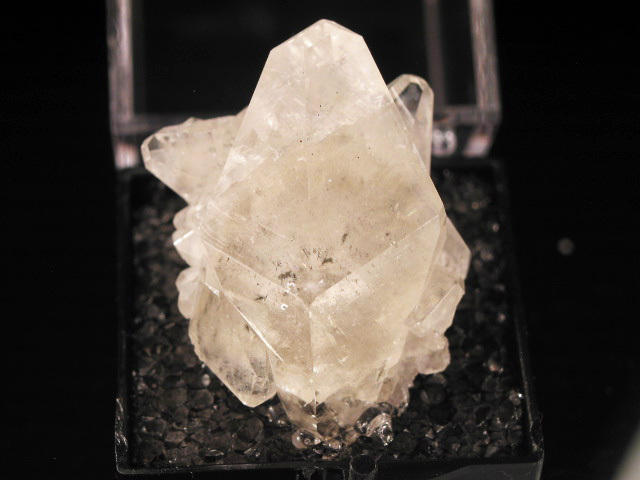 A very good crystal of petalite, from Mogok. 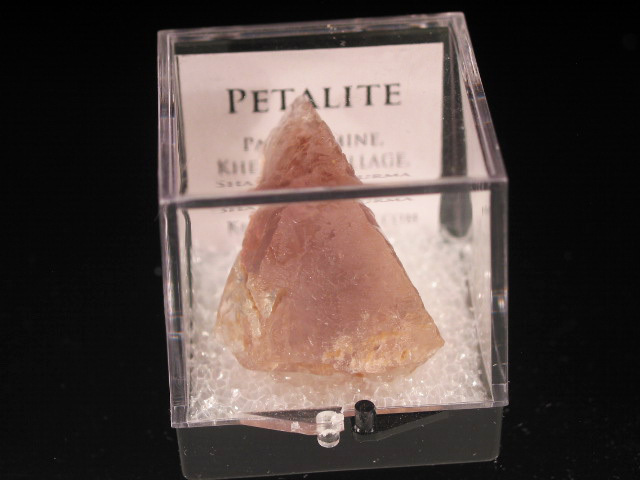 When I think of petalite I usualy think of heavily etched masses, but these Burmese examples actually show good form. 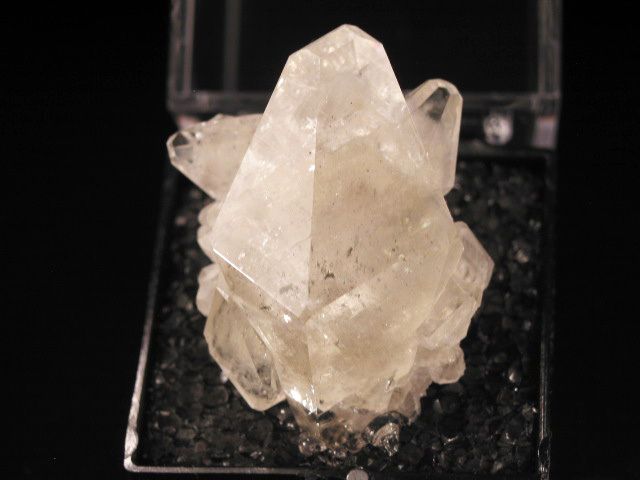 A very good crystal of petalite, from Mogok. 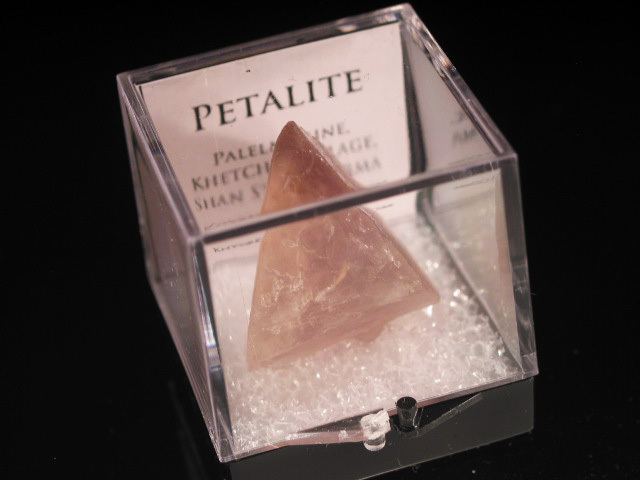 When I think of petalite I usually think of heavily etched masses, but these Burmese examples actually show good form. 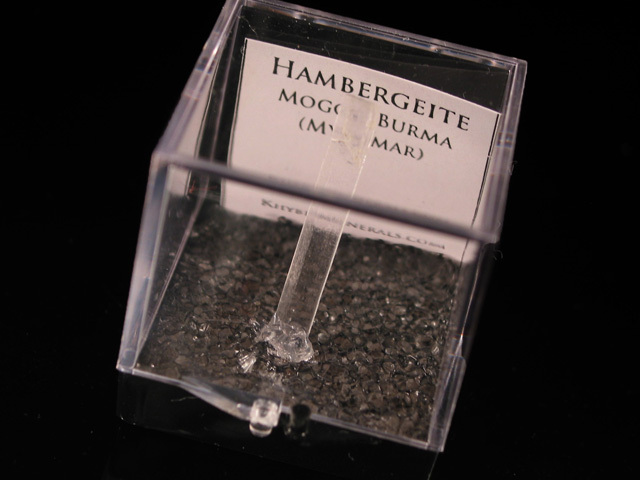 A nice crystal of this rare earth niobium oxide, from Mogok. 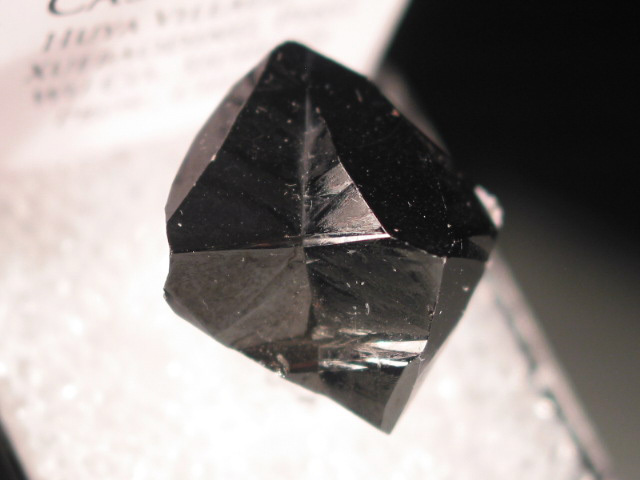 The gem tracts are primarily known for their rubies, sapphires and spinels, but also produce a few rare earth bearing species. 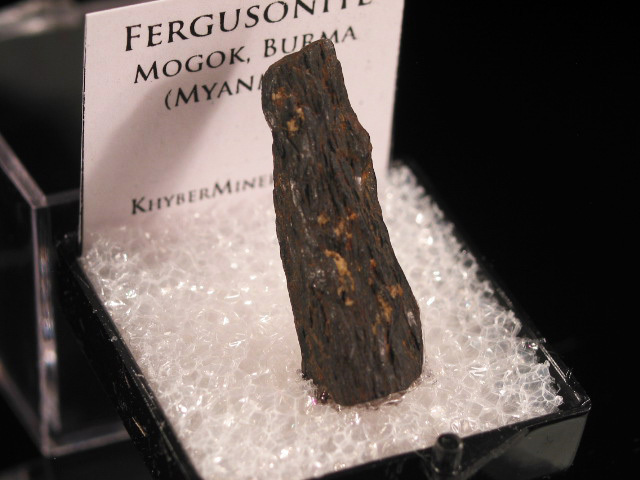 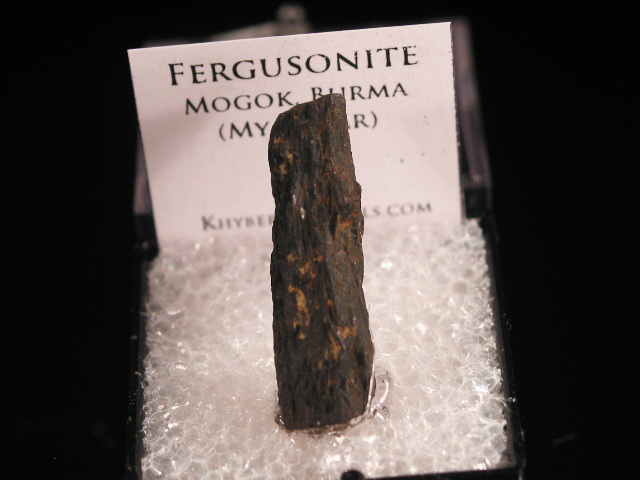 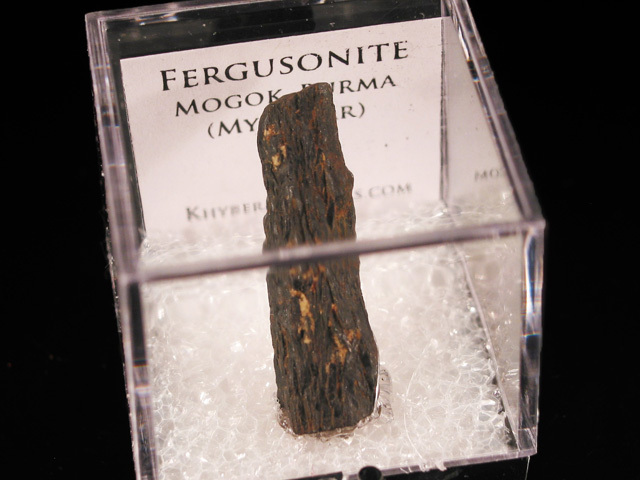 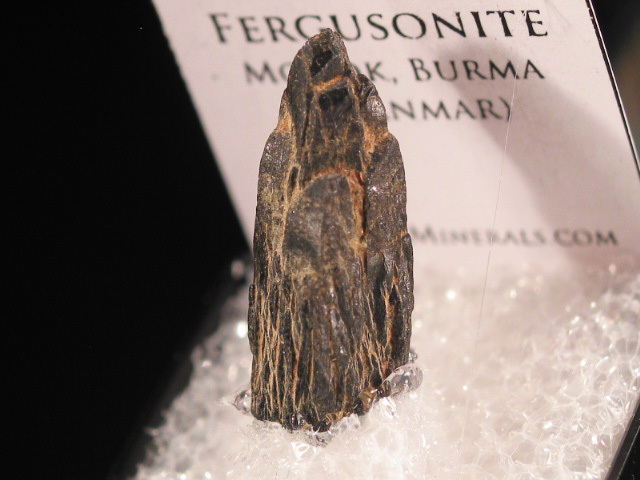 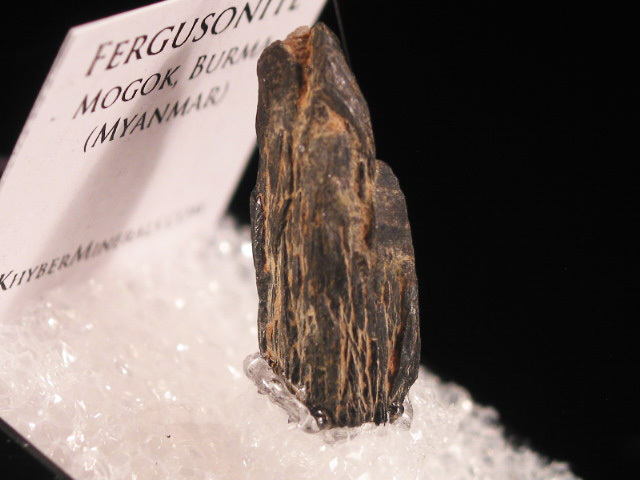 This is a sharp thumbnail of fergusonite, rather hard to get except from Canada and the odd Norwegian specimen. 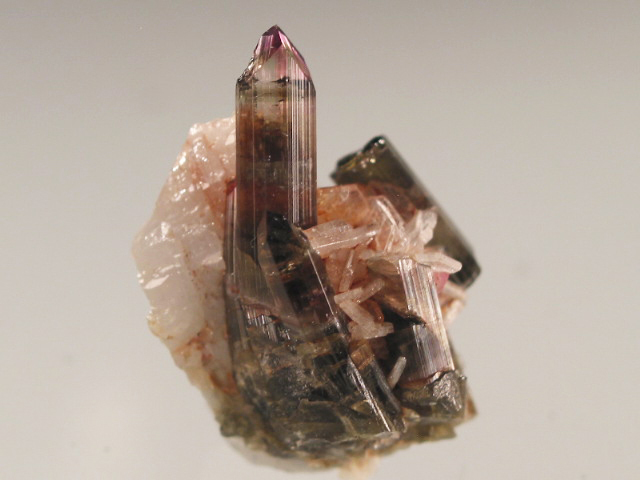 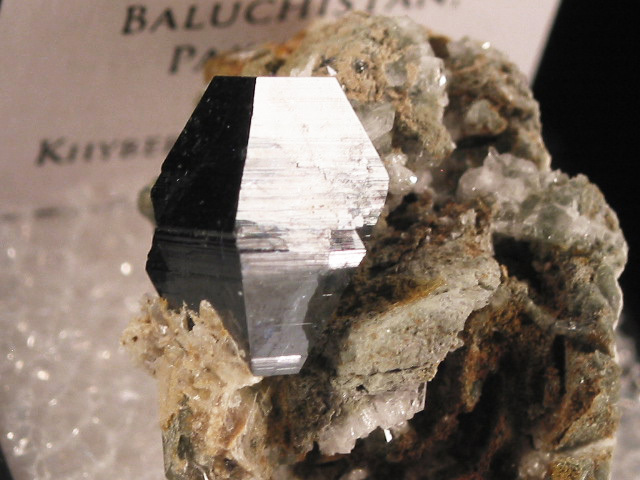 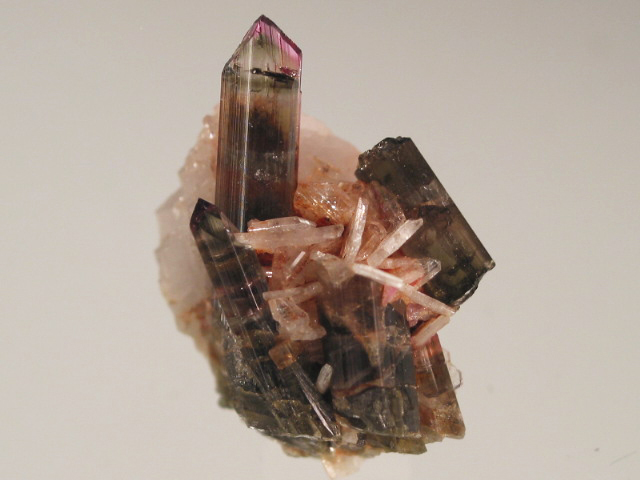 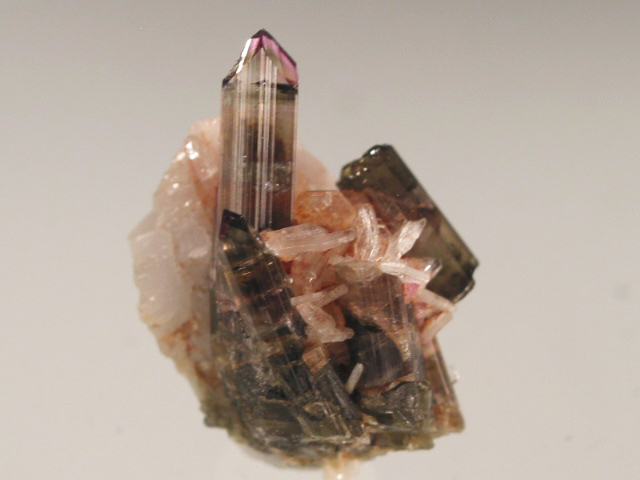 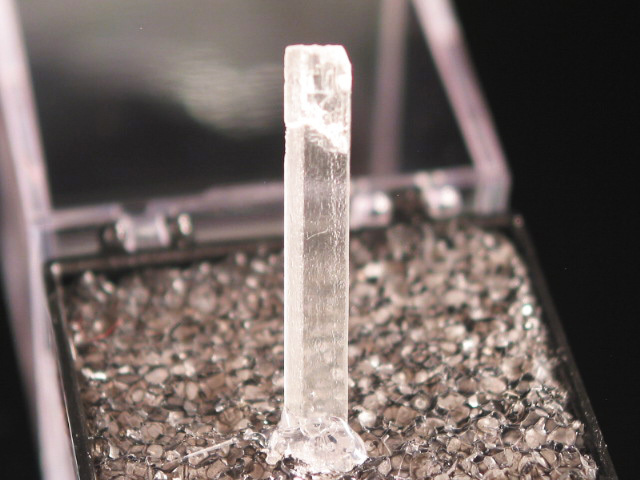 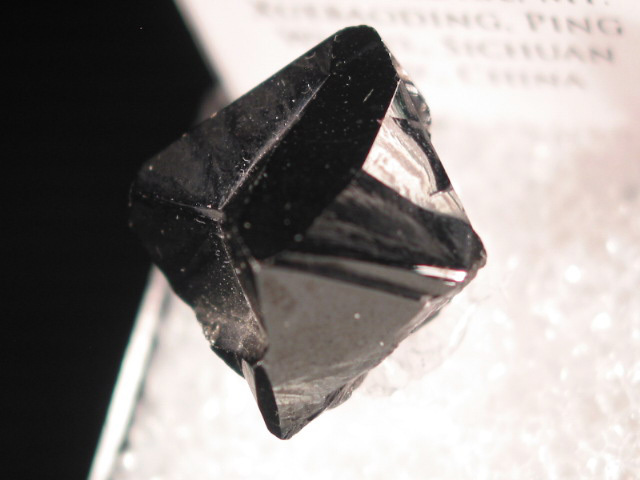 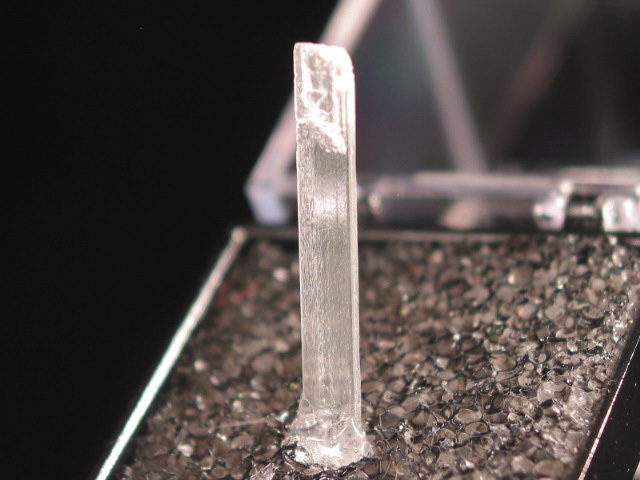 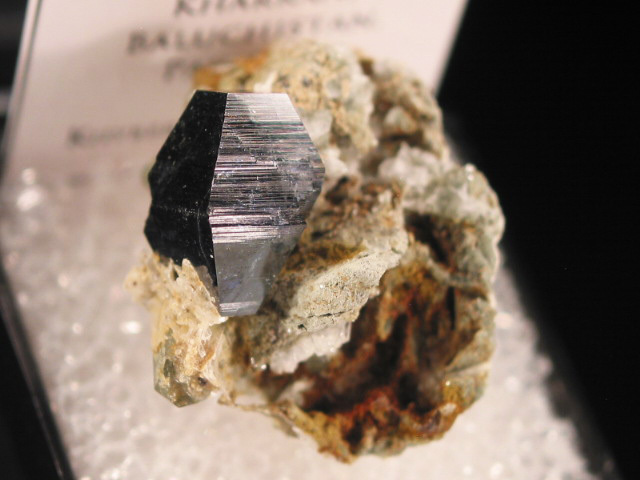 A sharp, terminated crystal of the tantalum rich variety of rutile. 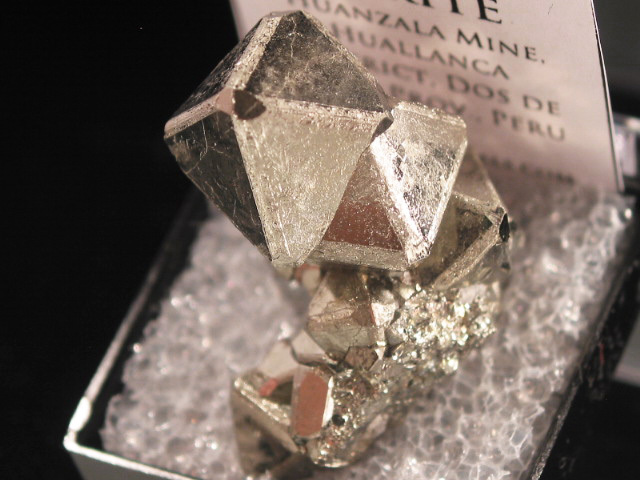 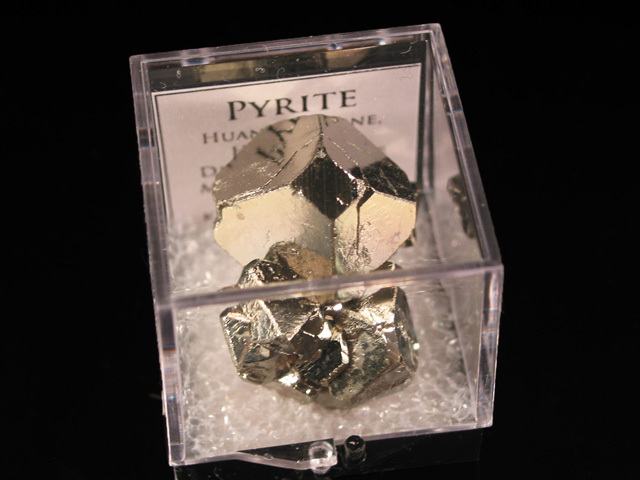 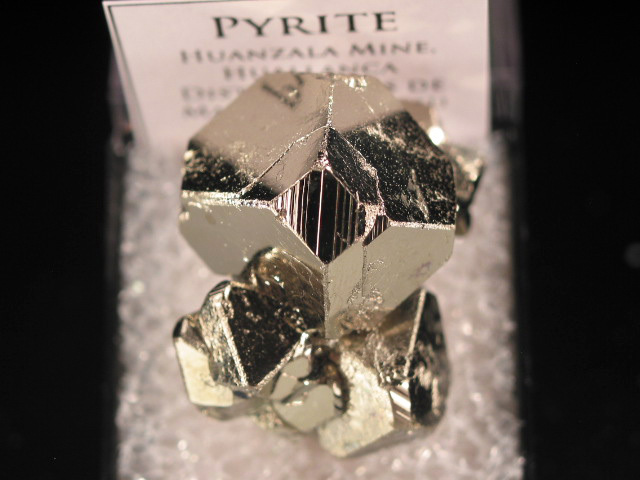 A nice thumbnail of octahedral pyrite from the Huanzala Mine. 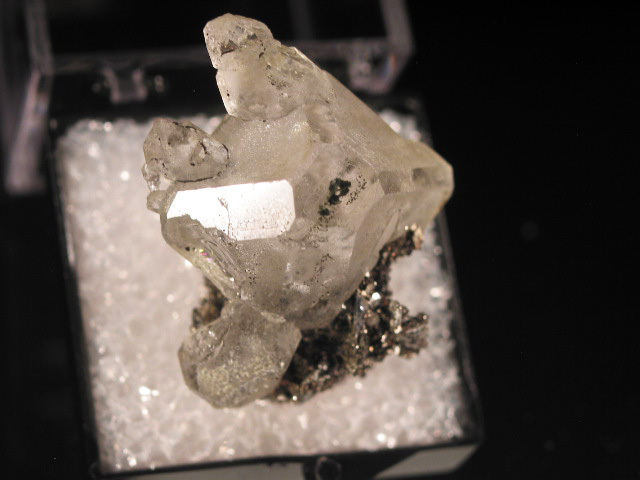 Another example of something that is usually found as larger samples. 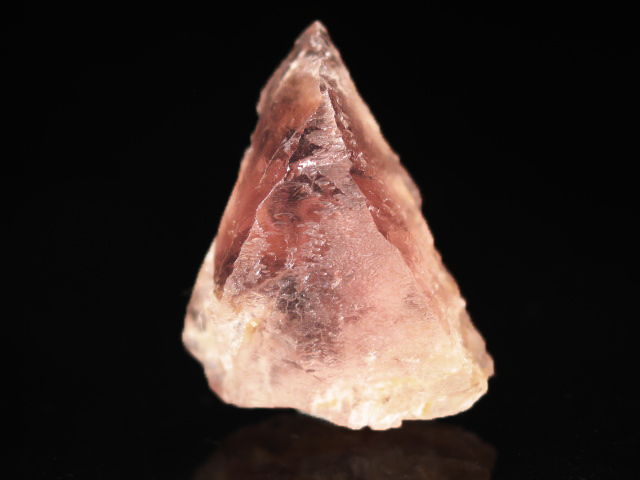 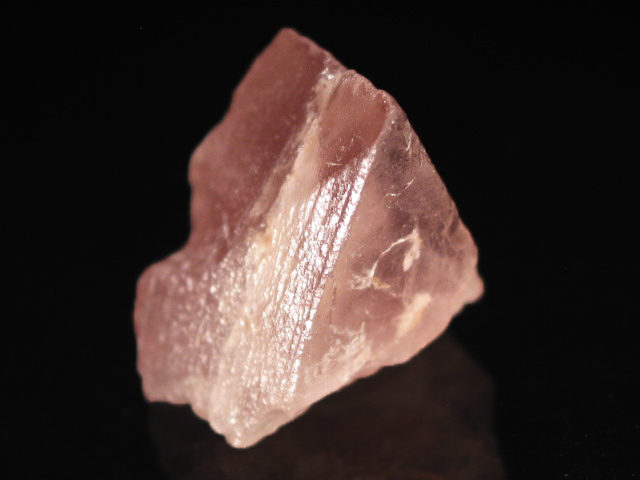 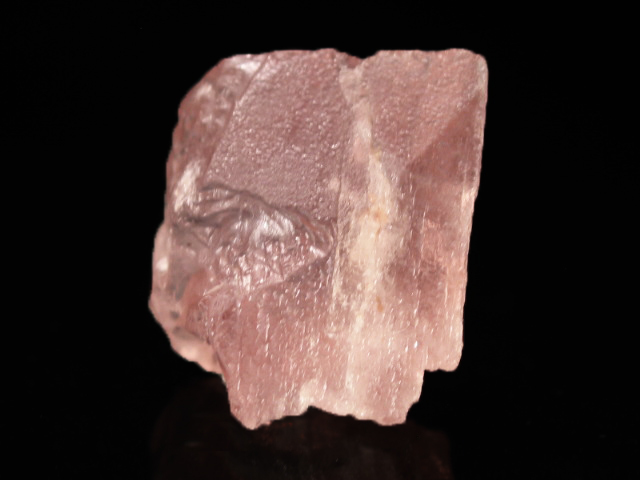 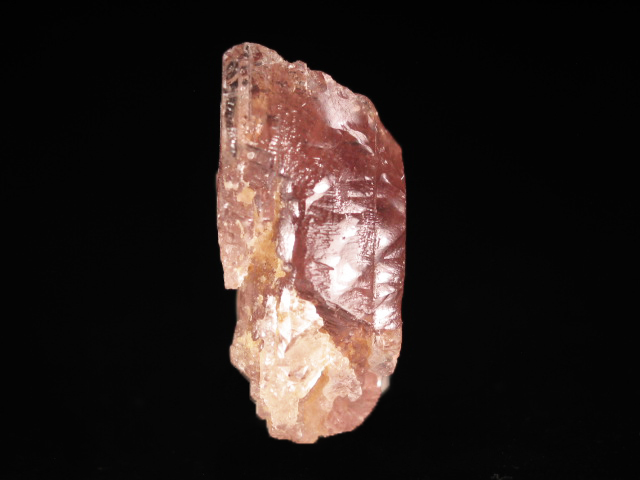 A very faintly pink morganite crystal, doubly terminated on a bit of matrix. 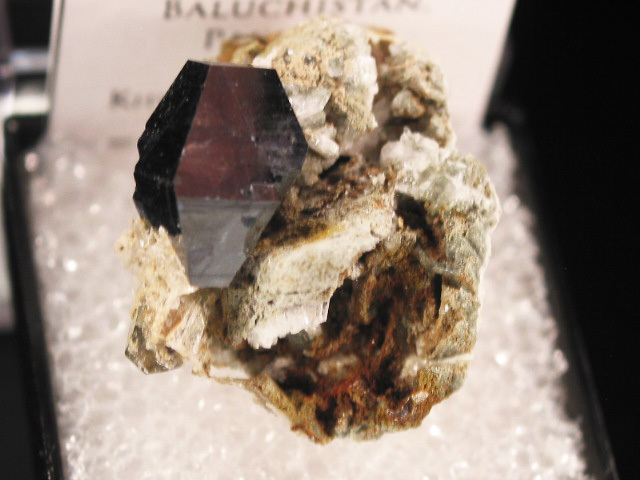 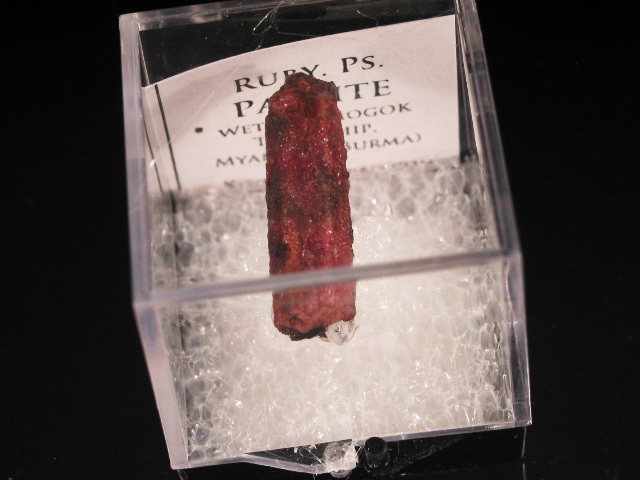 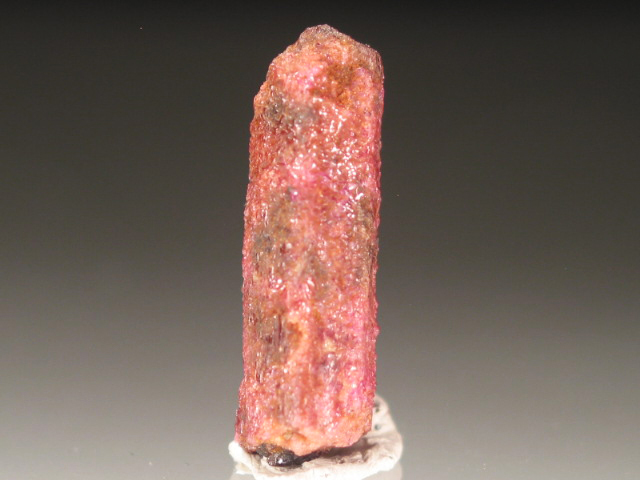 A painite crystal partially pseudomorphed to ruby. 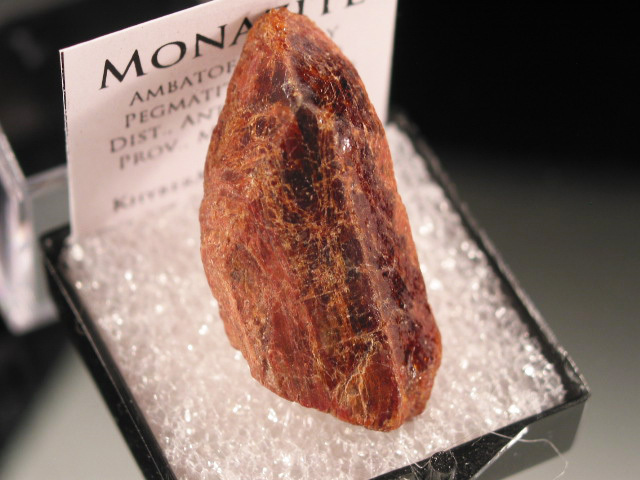 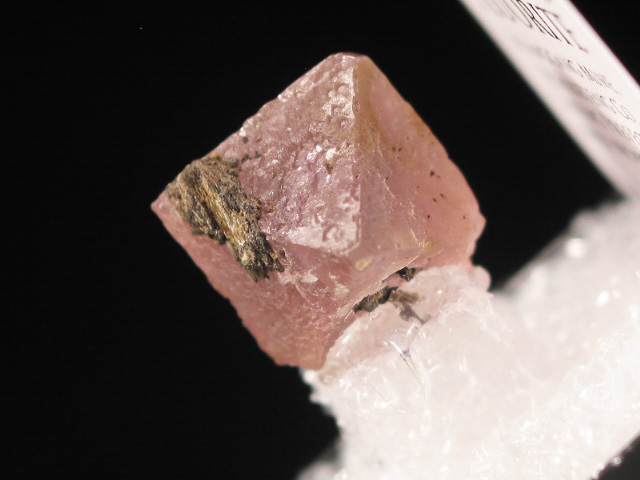 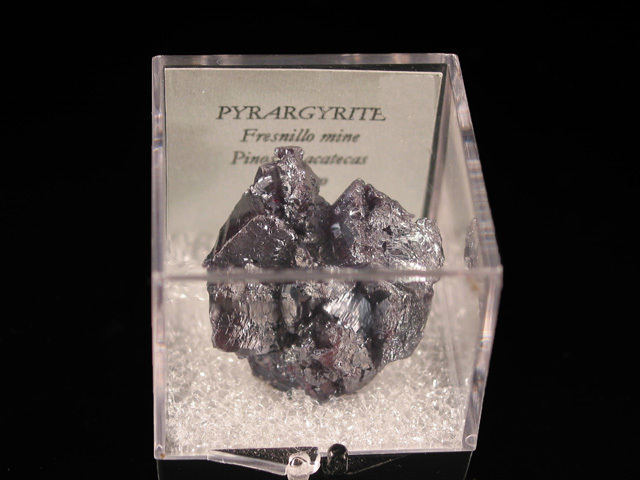 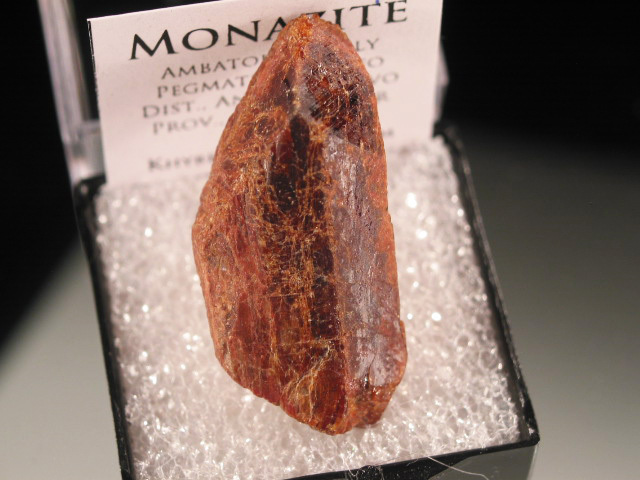 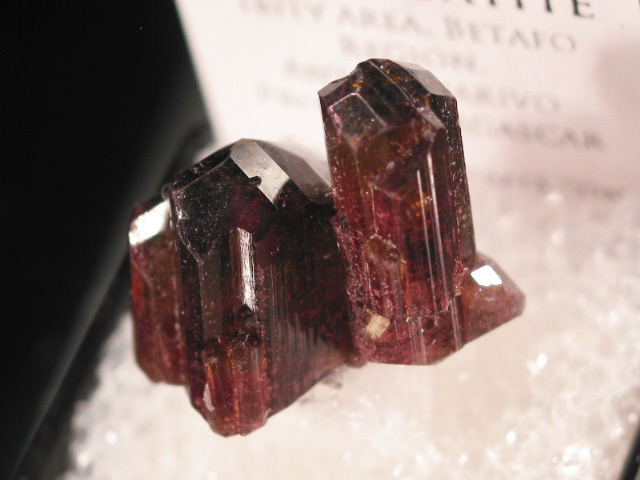 Small rubies were found associated with many of the painite specimens, and in some cases, the painites had even been pseudomorphed. 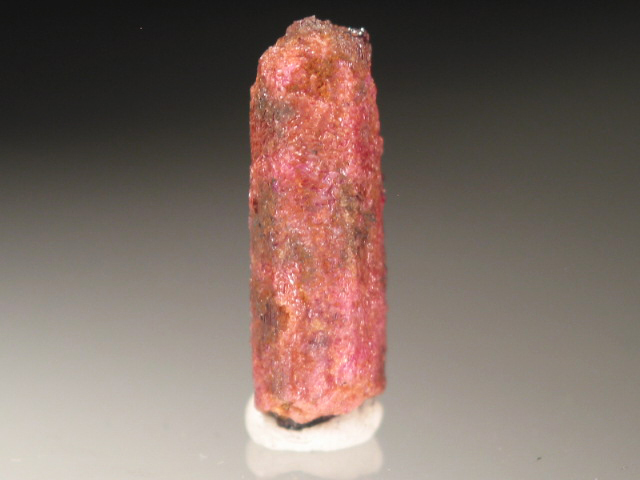 This one still retains a painite core, though the outer rind in pink ruby. 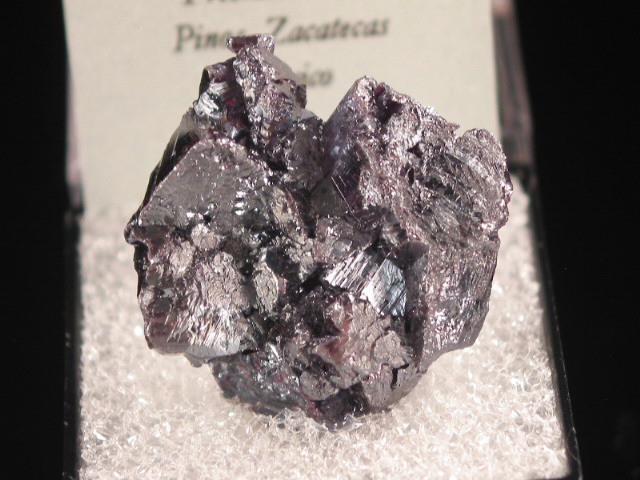 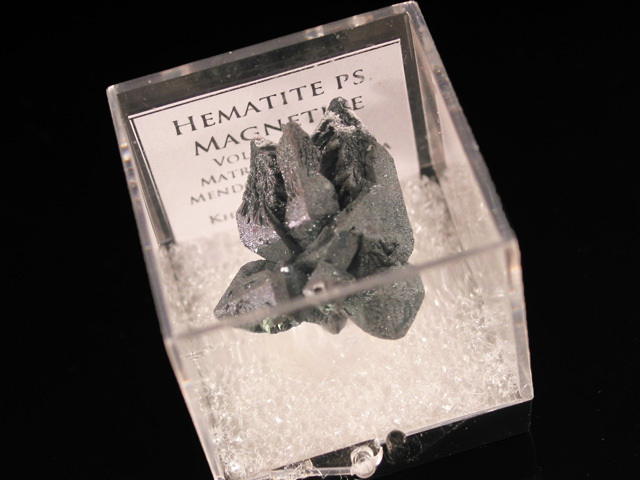 Up until several years ago, painite was widely touted as the world's rarest gemstone, with fewer than 20 carefully documented crystals having been collected since its discovery in the 1950's. 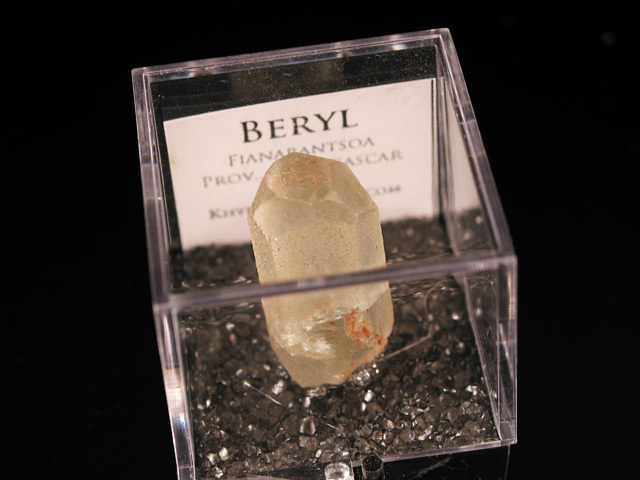 Then in late 2005, there was a large find of the stuff that finally made them available to collectors. 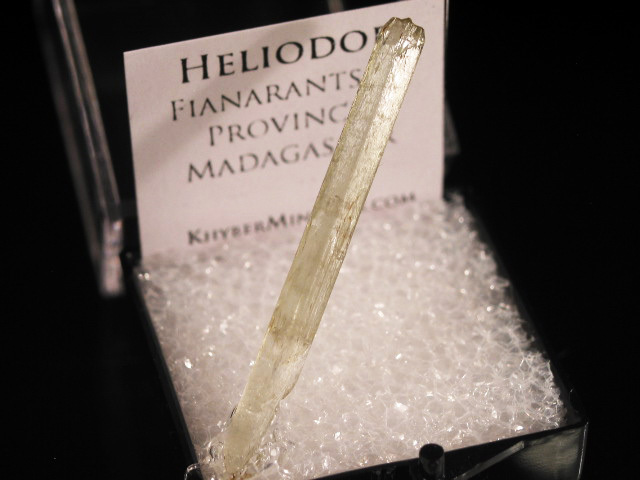 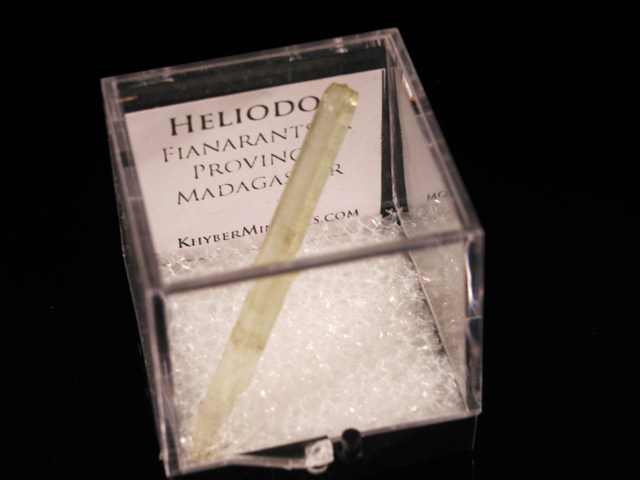 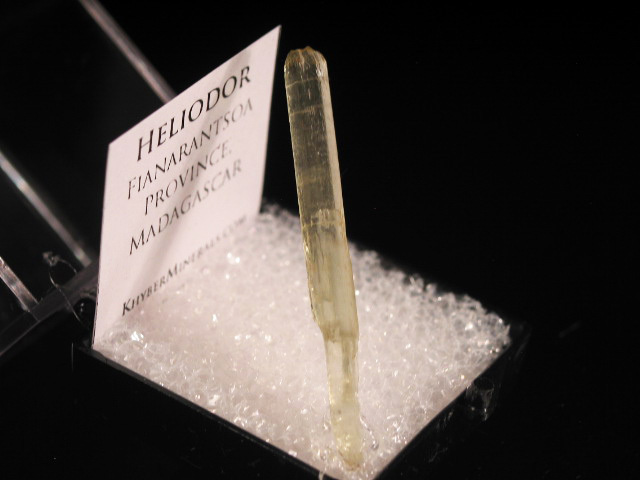 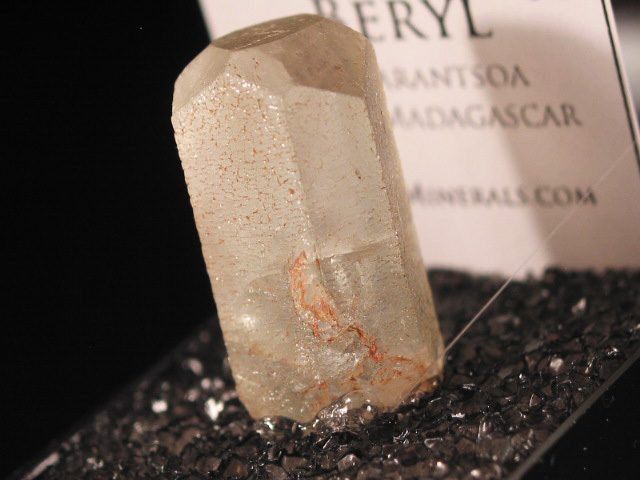 A gemmy terminated and etched heliodor crystal from Madagascar. 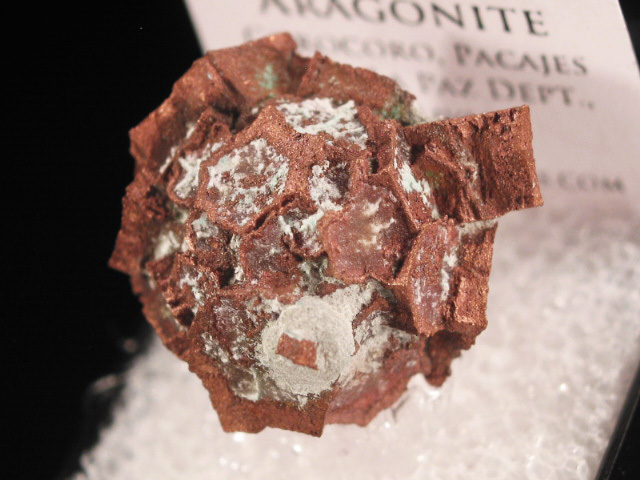 A nice ball shaped aggregate of hexagonal aragonite crystals, that have been replaced by copper. 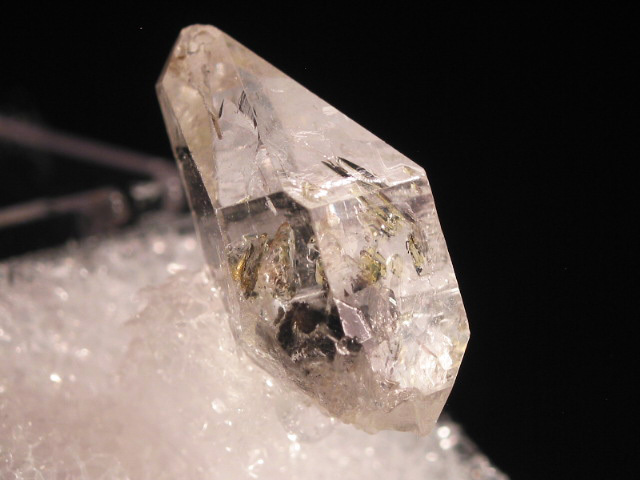 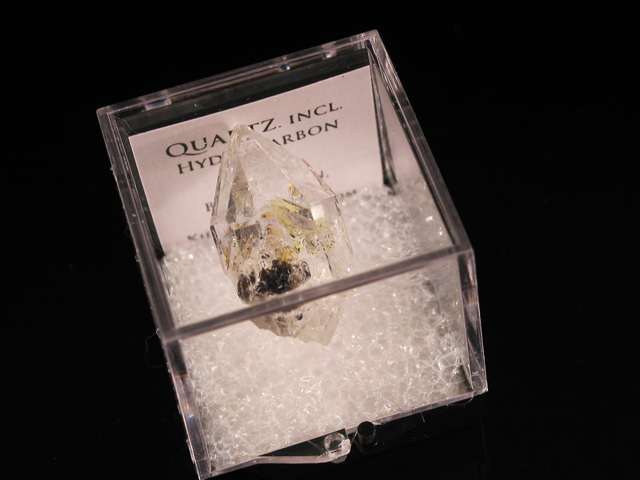 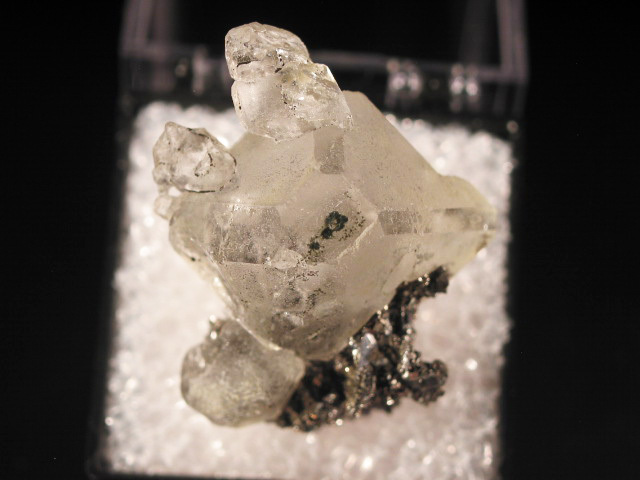 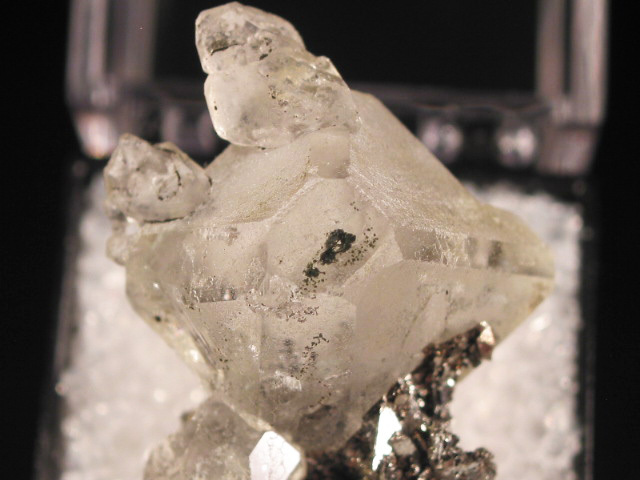 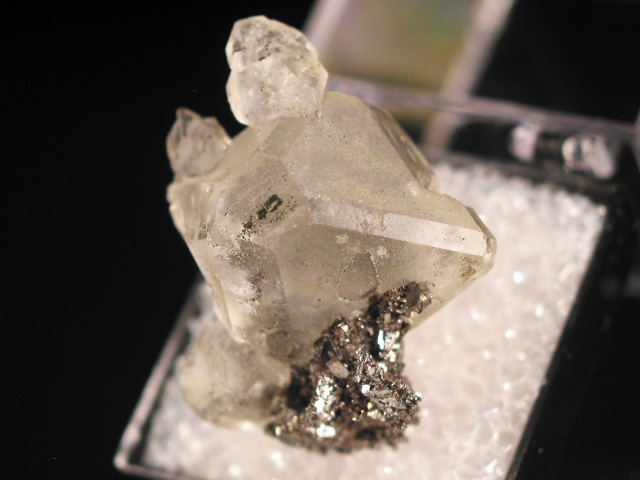 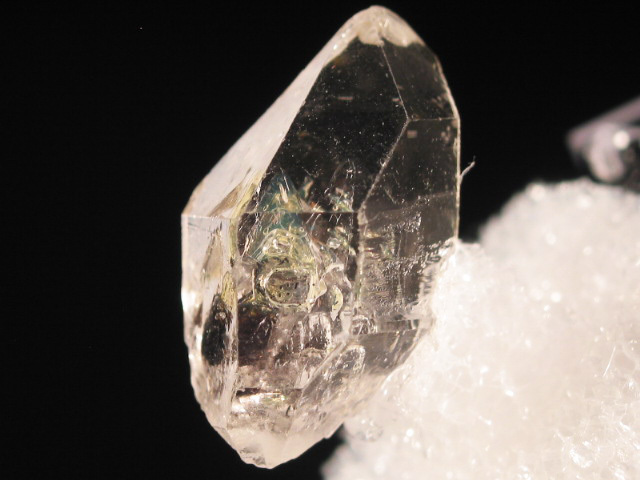 A doubly terminated quartz crystal resembling a Herkimer diamond, included by yellow and black hydrocarbons. 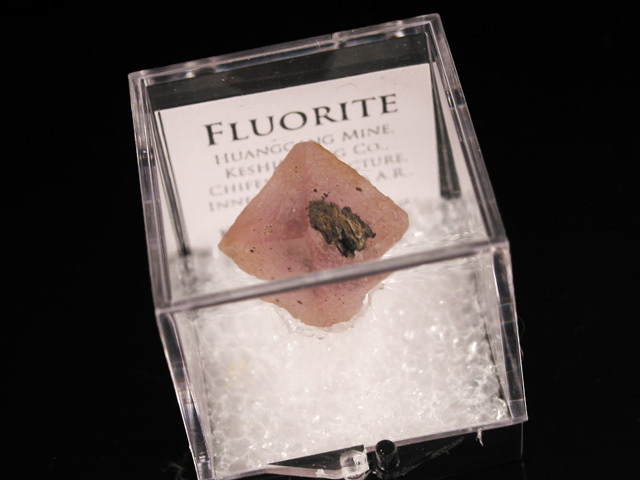 Fluorescent. 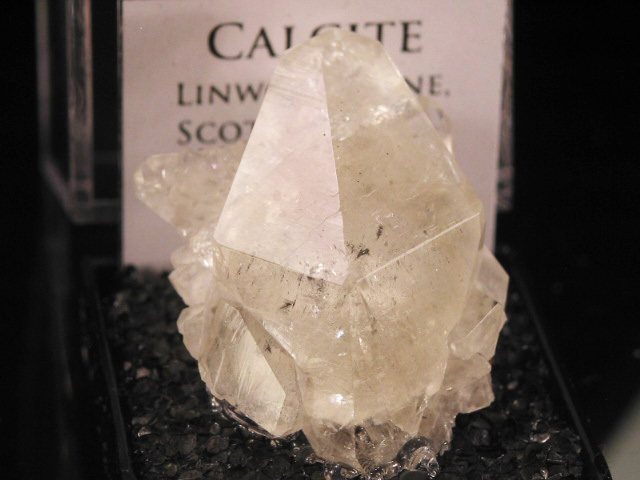 A pair of twinned calcite crystals from the Irving Materials Quarry. 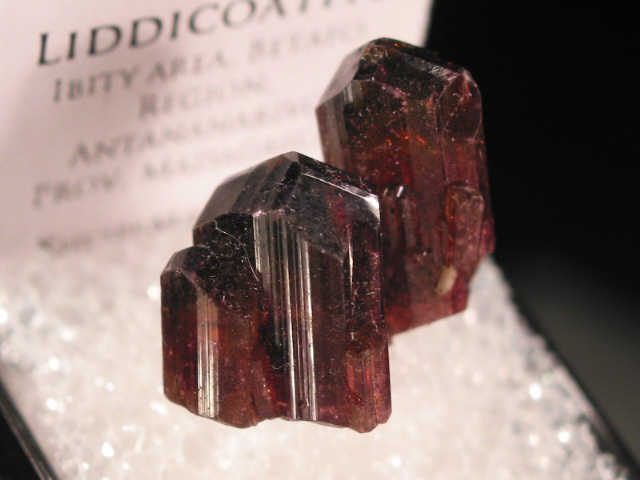 These are probably some of my favorite American calcites. 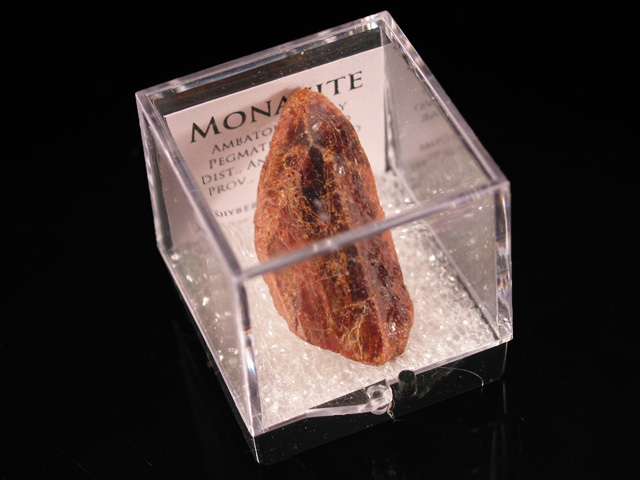 This thing just barely makes it into the box. 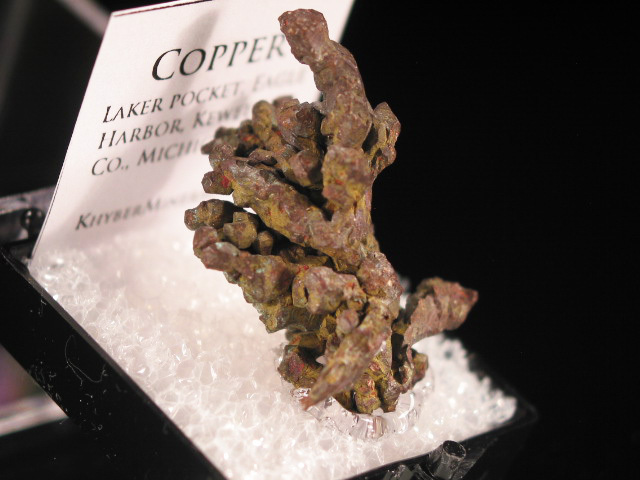 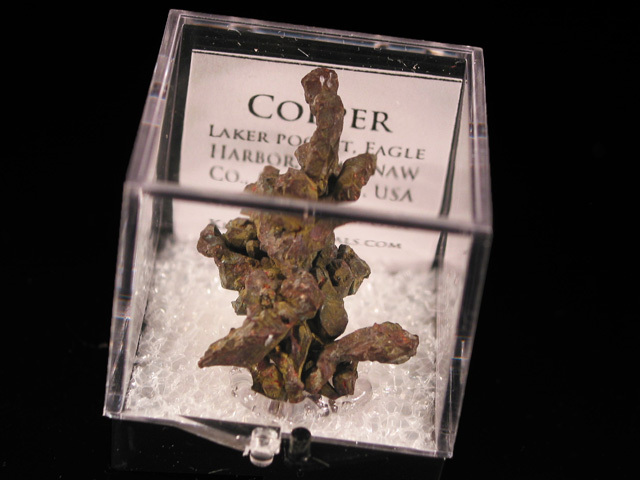 A nice thumbnail sample of crystallized copper, from the famous "Laker Pocket" discovered by divers under the waters of lake superior. 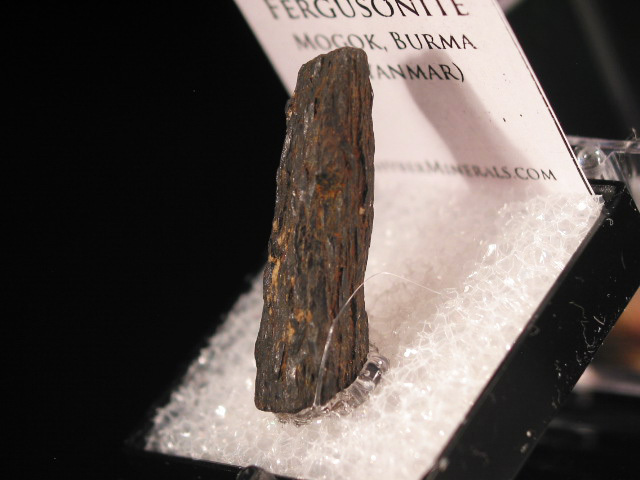 This piece displays the distinctive patina of pieces from the find. 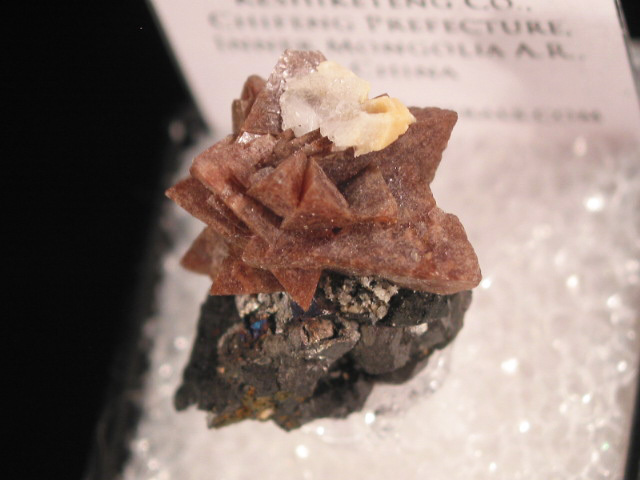 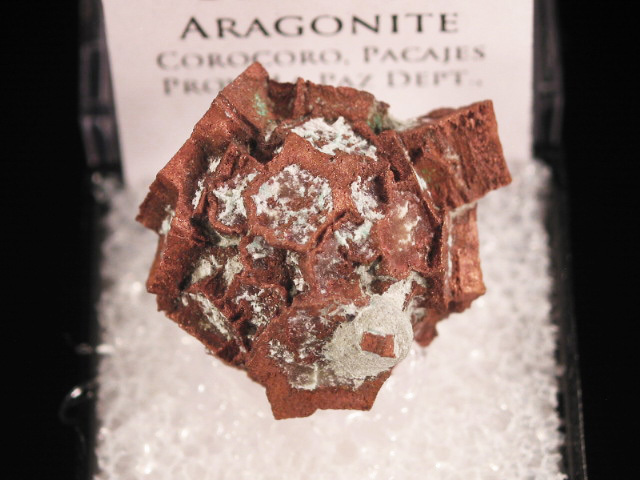 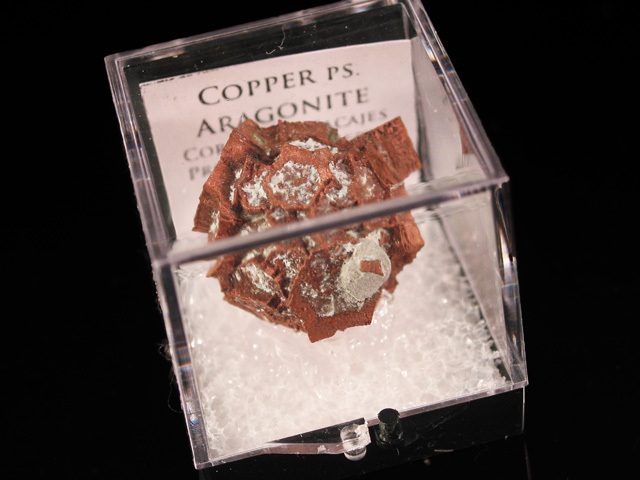 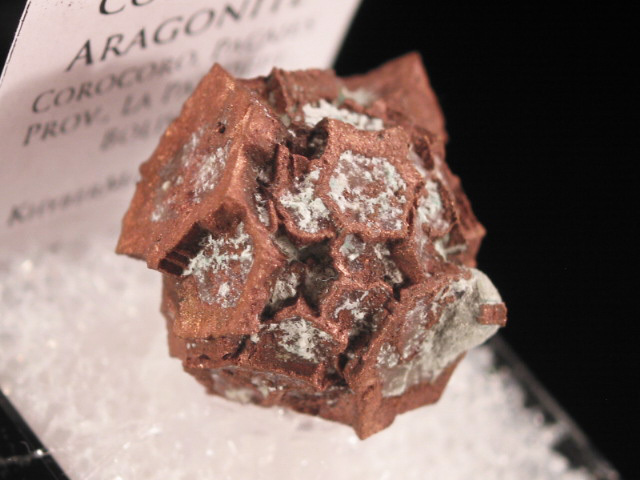 A hexagonal crystal of aragonite, pseudomorphed to copper. 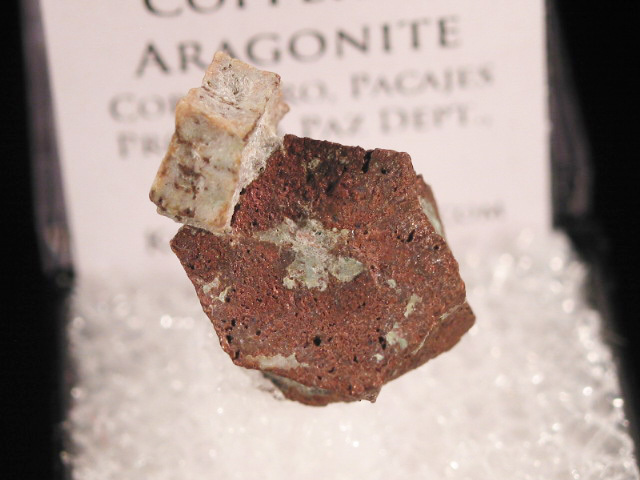 This thumbnail is a bit more interesting though, because there is a second aragonite crystal perched on the edge of the first, and interestingly enough it has not pseudomorphed-- it is still aragonite. 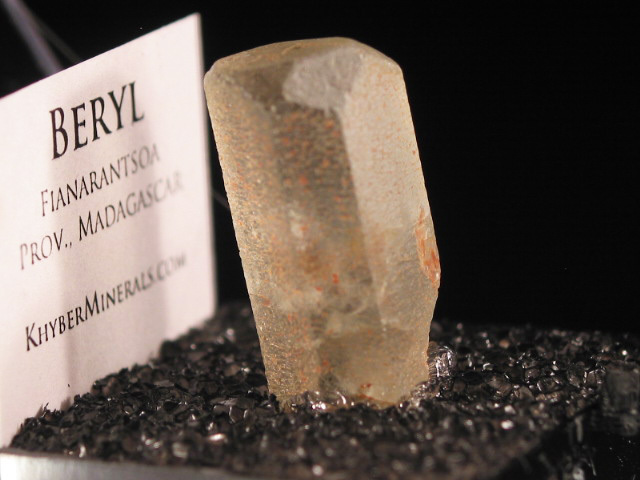 A nice terminated sample of gemmy beryl with etched sides, from Madagascar. 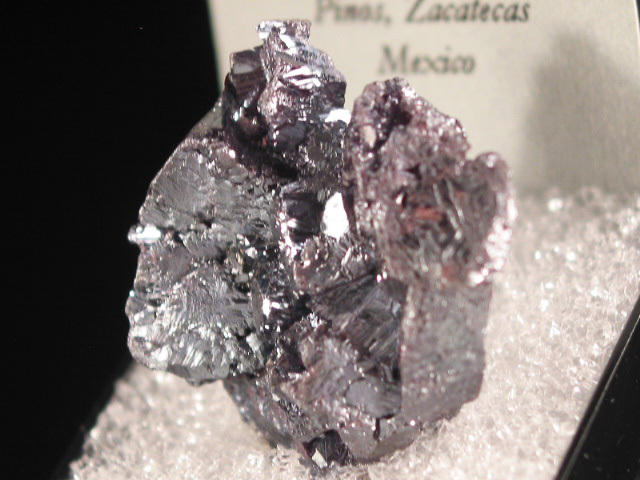 A nice thumbnail sized sample of this silver sulfosalt, from Mexico.